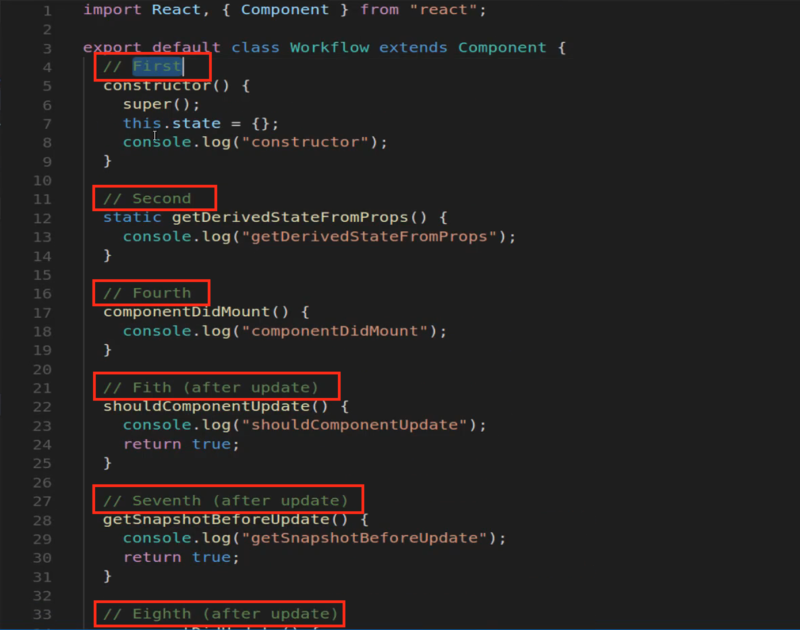 Welcome to this deep dive on react’s component lifecycle workflow. 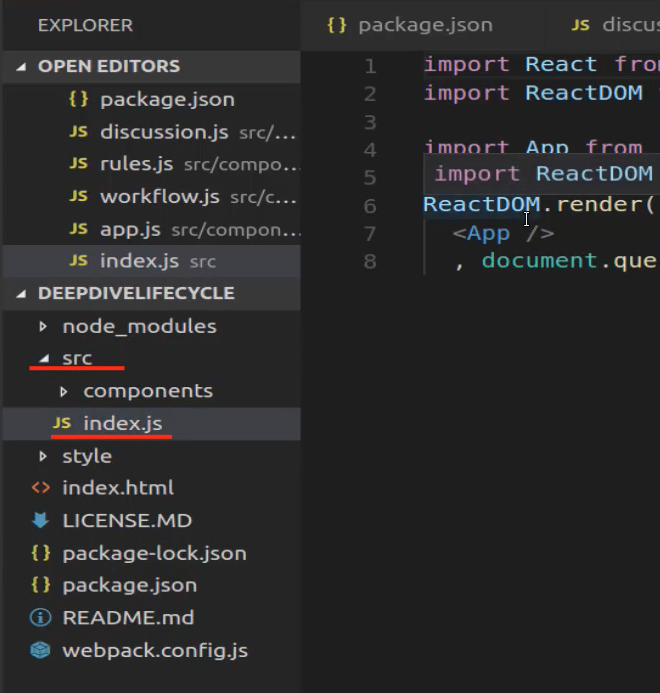 Now if you were relatively new to react then the component lifecycle methods may seem a little bit confusing. And so that’s what the goal of this guide and then the screencast is going to be, is I want to simply take all of the magic out of the process so that you can understand it. And by the end of it hopefully, you’ll see that these methods are even pretty intuitive and you’ll see how you can use them in your own projects. 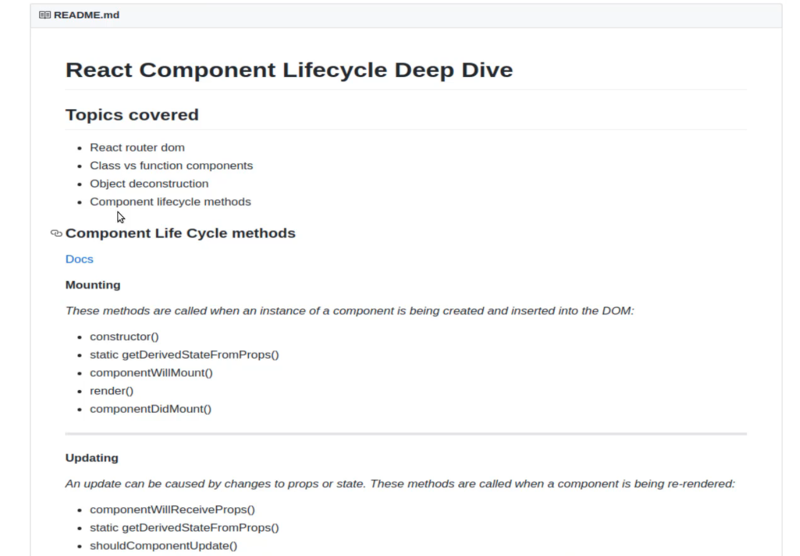 Now before we dive into the code and we walk through each one of the lifecycle methods what I want to do is I want to take a step back and I want to draw a real-world analogy for the way that component lifecycle methods made sense to me. And in order to do that we are going to take a drive to a fast food spot. Now you can pick out your favorite, I’m going to go with “In n Out”. Anyone watching internationally may not know it. It’s a delicious burger joint that I go to whenever I’m in a city that has it. We’re going to use this trip to help have a high-level understanding of how these lifecycle methods work. So we’re going to go to the drive-thru. But before we do that we first have to drive up to the restaurant as we do that. If you’re anything like me you start trying to make up your mind on the kind of things that you’re going to want to order. Well in react’s world that is called the Mounting process. So what we’re doing during the mounting process is we’re picking out what kinds of data and processes need to occur when that component is going to load. So if it is some kind of page content type of component and we’re getting data from some outside API then we need to implement all the processes that will occur so that when someone navigates to that component then we’re putting the right steps in place so that the page will have content. That’s the mounting process and it’s that first stage kind of like when we’re going to the drive-thru and we’re starting to pick out what we want to order. So moving right along, we’ve pulled up to the drive-thru order window and we’ve placed our order, and that’s all part of the mounting process. When we take in relation to react, so that’s kind of like us going to a page and having the page load. Now, what happens if the voice coming at the other end says something like “Oh, that is not available today. You need to order something else.” Well, we can change our minds and then we can give another order or we could update our order. Well, that is also a lifecycle method in react. So each time that you have a component that gets updated. So that could be as simple as someone typing into a form component or it could be something even more advanced like a WebSocket where you’re getting live stream data into your application every time that happens a number of other lifecycle methods occur. So you have access at each stage of that lifecycle. 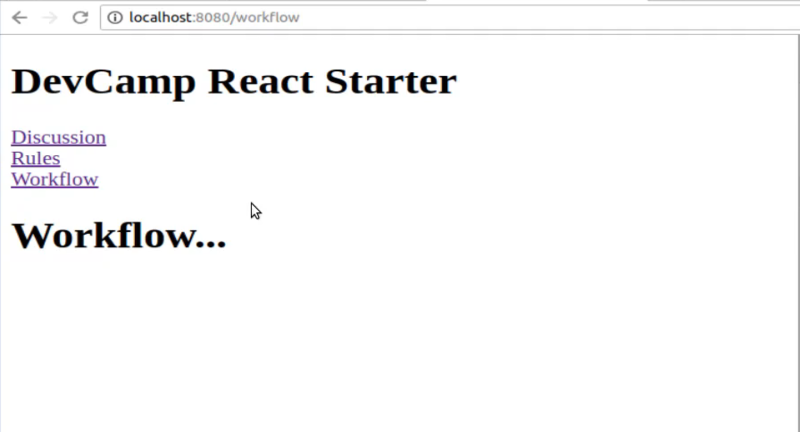 So from the very beginning before the page and that component have even loaded all the way through to when you might need to make some live changes and it also comes into play with how react is so good at performance because during that update process even though you have access to all of the various workflows that are occurring when something has been updated react is very good at being able to tell the difference so in other words if you have a big page component and only one part needs to update. So if you have eight components on a page and only one of those needs to update in that lifecycle method only one component will need to be updated, so all the other ones remain the same. That’s part of the reason why react if implemented properly has very solid performance. So we’re almost done with the entire lifecycle. We have gone from the very beginning before we pulled up we decided what we wanted to order. We updated our order when we found out that they had some changes on the menu and then we drive up and we pay, and then we receive our food, and then we drive away. Well, that is called The Unmounting process so as you drive away there are a number of things that you do. 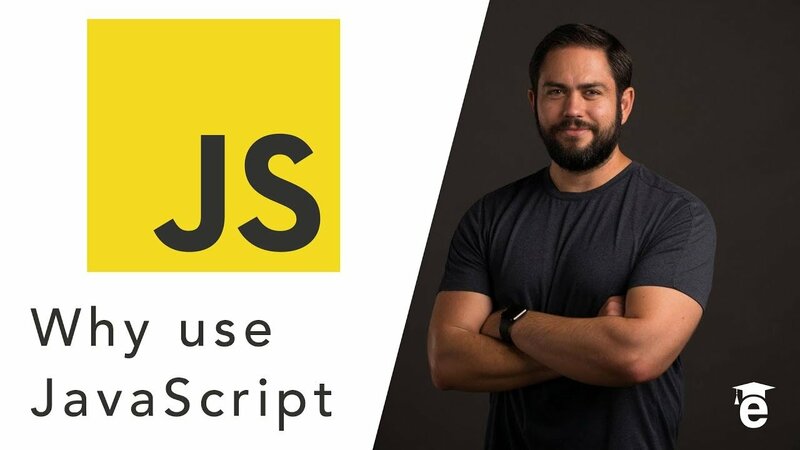 You start to put the car in drive, you move forward, you make sure no one is in front of you, and then you leave the restaurant kind of like with some type of component in react, whenever you don’t need that component anymore you have access to that leaving process that unmounting process and the example that we’re going to work through is going to mimic a type of chat bot so it’s going to be a system where you could have all kinds of discussions and chats that are occurring and you may have hundreds or thousands of them occurring at one time. If the individual leaves that page so they want to navigate somewhere else in the application you don’t want that component going in the background, that’d be very very bad from a performance perspective. So when they leave or when the component is unmounted then you can do some cleanup tasks. So we’ve started the very beginning which is the mounting process. We’ve updated and then we’ve unmounted and inside of each one of those categories is a full set of methods that you have access to. 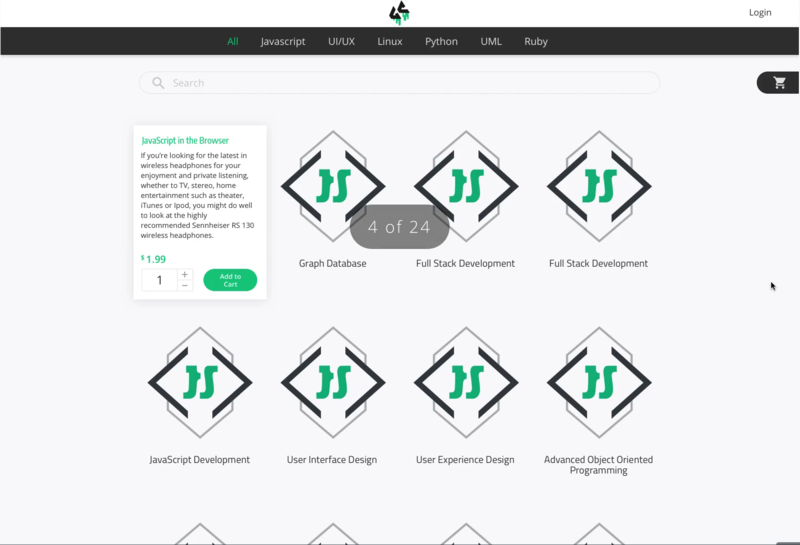 And we’re going to walk to every single one of them and hopefully, by the very end of it you’ll be able to see that really all these methods do is they give you access to perform whatever task you need at whatever stage of the user’s experience with your component. And we’re also going to talk about a few other concepts in order to implement this properly. We’re going to implement routing in our system along with a few other fun projects. So now that we have the high-level view and some analogies on what lifecycle methods are let’s dive into the code. 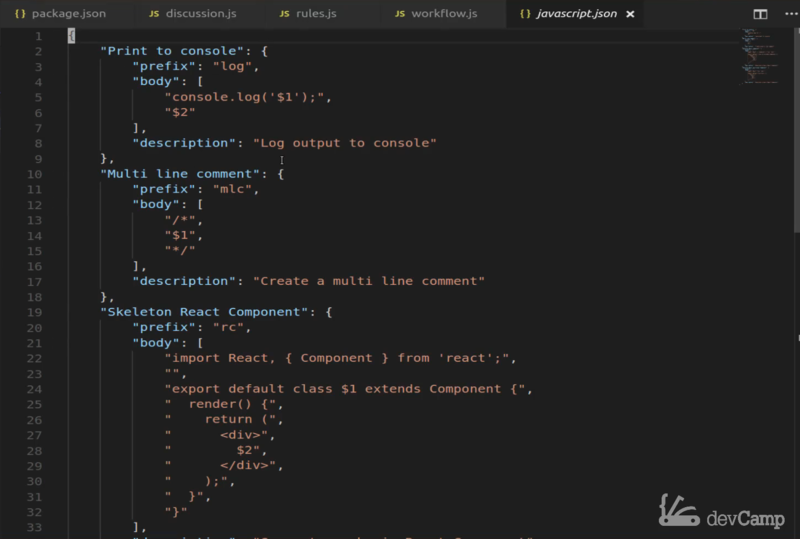 Now, that you have a high-level overview of the basic flow of the component lifecycle inside of react. Let’s actually dive into the code and see exactly how it works. Now I have this completed project right here and it’s on github I’ll put it in the show notes so that you can view the code and I also inside the readme added quite a bit of content. 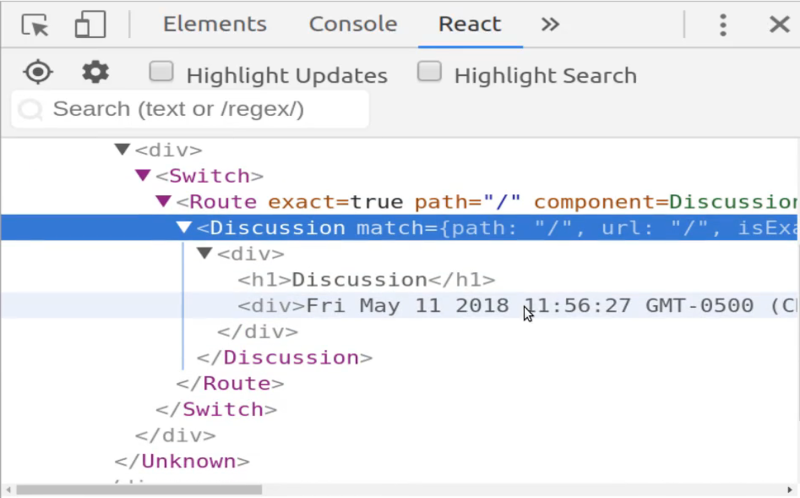 So I added the topics that were going to cover such as making sure we cover the react router dom. We’re going to talk a little bit more about class versus functional components, object deconstruction, and then most importantly we’re gonna spend most of our time talking about the component lifecycle methods. I also copied the documentation, so if you come to the react docs then right here you’ll see it has the full lifecycle set of methods. But this is a little bit confusing because imagine that you just copied each one of these lifecycle methods into a project into a component you’d actually get a number of errors because several of these as you can kind of see are marked as being unsafe. And so I put all of those inside of the dock. But then what I did is inside of one of the components I cleaned it up and I only use the components that you are actually going to want to use. So hopefully that can kind of help streamline the way you think about them a little bit more. So if you click on this workflow component I put in the methods that you actually want to use. And I also placed in the order that they’re called in the comments. And so once we build our project I’m just going to copy this whole file over and then we’re going to walk through the order that everything is called in. and the name I’m going to give this is going to be DeepDiveLifecycle so it’s going to generate that for me. And now I’m going to cd into it and then run npm install. 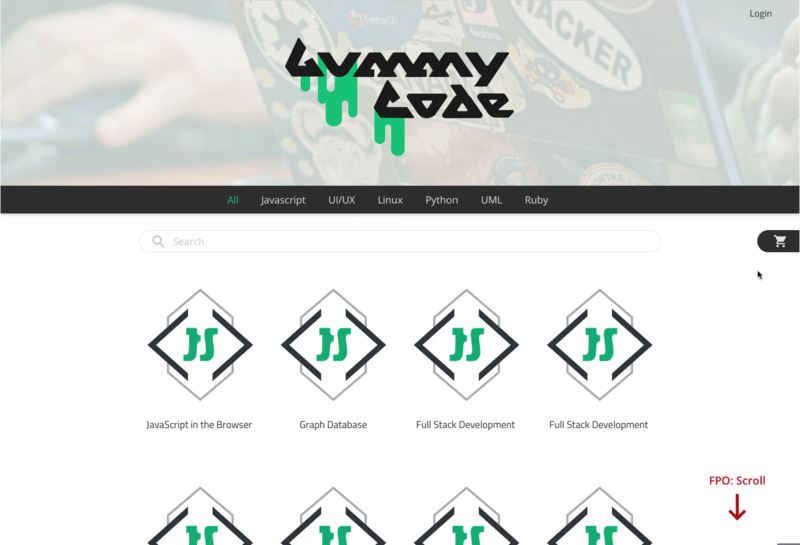 Fast forward it as all of the dependencies are installed and then I’ll come back when it is live, okay we’re back and it looked like everything installed properly. So I’m going to run npm start and I’m gonna keep the server running in the background so we can come to the browser go to localhost: 8080 and we can see that that is running properly. and we will have our project right here. This deep dive is going to have two components and I don’t mean react components. It’s going to have two types of projects that we’re gonna work through, We are gonna put them all in one codebase. But I want to start off by showing you what we discussed already with being able to see the timing on when all of this occurs. 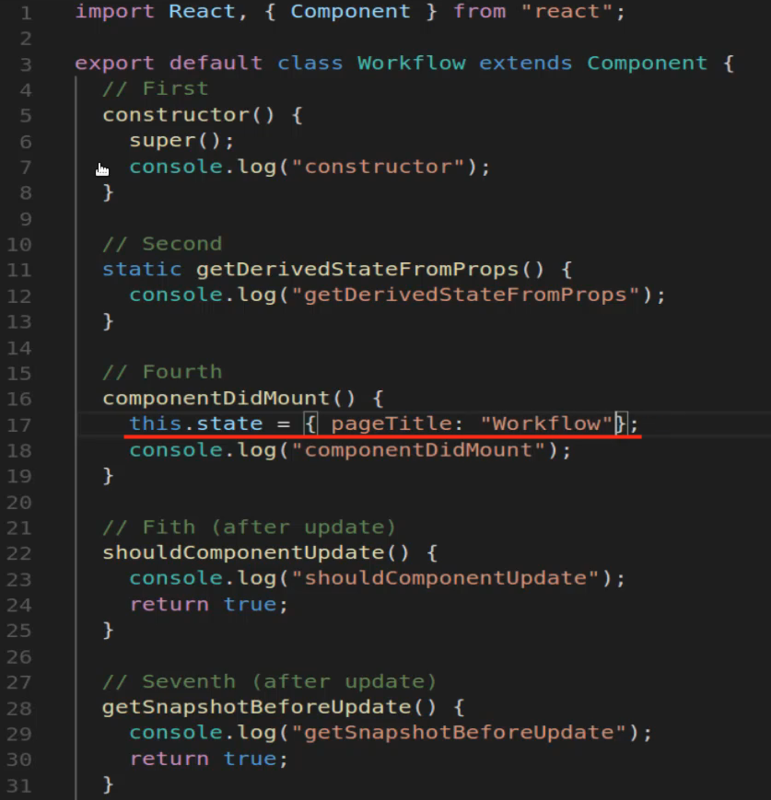 So I want to be able to have this workflow where we can see when the constructor is called, when getDerivedStateFromProps is called, all of those things so we’re going to incorporate all of this but we do this a little bit later because I want to show you how you can do it when you are navigating from page to page. So the first thing that we’re going to do is we’re actually going to implement a little bit of functionality so we’re going to build out a few other components and we’re going to mimic a chat type system. So we’re going to see how we can build that out. We’re going to add in those components and then from there, we’ll eventually get to where we can see literally like in the console we’re going to be able to see when each one of those lifecycle methods is called. And in order to really be able to see this, this is the reason why I want to install the router so that we could see, we’re going to have multiple components on the page and we’re going to click. So what we’ll be able to see is if you come here to our localhost we’ll have 3 links eventually and when you click on one it will act like it’s routing so it will go and it will only show that component and it will hide the other ones. The reason why I wanted to incorporate that in this particular deep dive is because that shows you how you can hit a few of those other lifecycle methods. So, for example, the unmounting process the best way of being able to mimic that is by using routing because you do want to leave one of the components and go to the other one so you want to unmount one. And so that’s why I want to include routing into it so that we can see exactly that entire process. 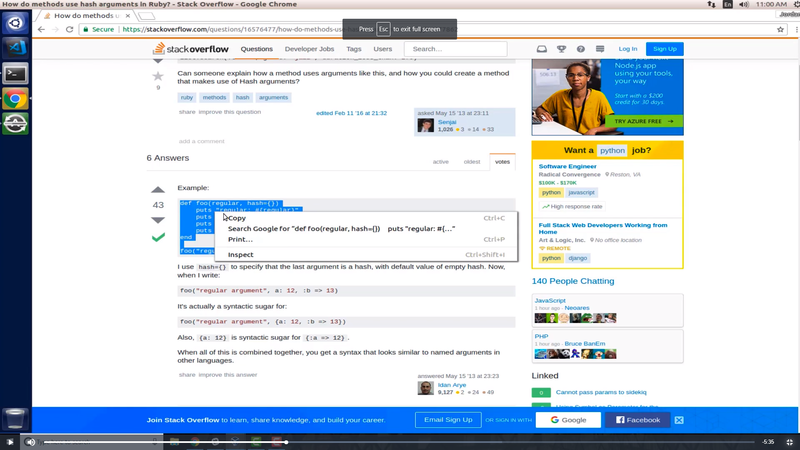 Now I’m also going to open up the dev tools here and I’ll open up the React tools. So make sure that you have these installed and this is just the react extension that is provided by Facebook, so I definitely recommend that you have this installed on the system. And now let’s go into our package.json file and we’re going to install the react router Dom library. So let’s say react-router-dom and I’m going to use 4.2.2 so that’s a version we’re going to use. And I’ll hit save, now in case you’re going through this guide and it’s been a long time so maybe it’s been even a couple of years or something like that. 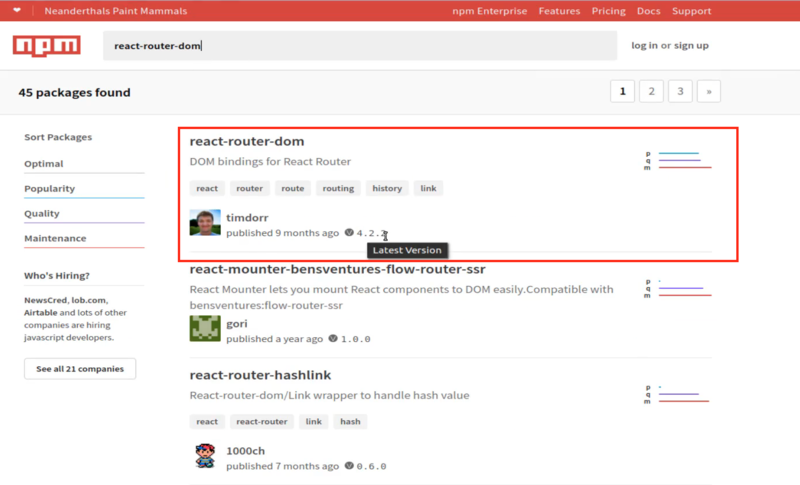 Then you can just go to the NPM registry here and type react-router- dom and then as you can see I’m using the latest version. So you can see whatever the latest version is for you right here. And then you can use that inside of your package.json file. So after you’ve done that come to the server, stop it, run npm install, it’ll install the new library the react router dom library for us. It’ll add it to the node modules and then we will be able to use it. So it’s now run npm start and assuming we don’t have the issues with that installation it looks like everything worked properly. So yes everything is back and obviously, we don’t have any routes or anything yet that is what we are going to add now. So let’s start by going into the src directory then components and let’s add these new files. So I’m going to create one that’s called discussion.js an inside of it I’m going to just have a basic react class component here and I’m going to call it Discussion and for right now let me just put some text here, so I’ll say div discussion that’s the first one. and then we’re going to build one more component which is going to be that lifecycle workflow one that I’m just going to call workflow.js and same thing. So rc and then this is going to be just workflow. 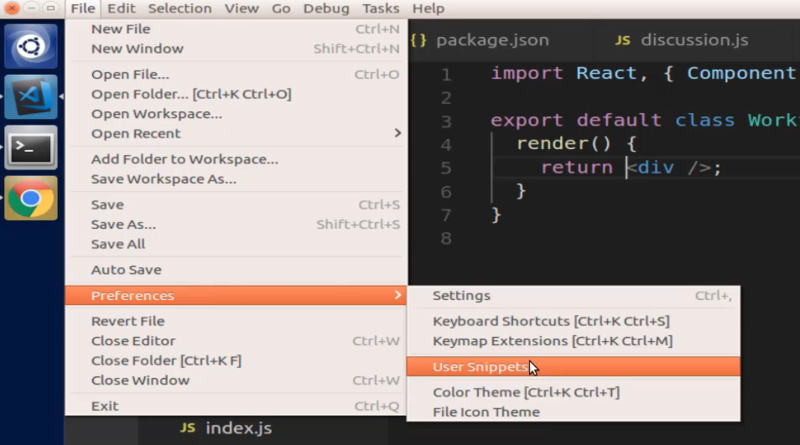 Now, once again if you notice how I only have to type rc that’s not something that you will have by default on your system that is in your vs code user snippets and I have a video on that if you are curious about it and so you can just simply go into your preferences and then into user snippets and so you can come down to preferences user snippets just like this. "description": "Generates a basic React Component"
so I have what’s called the skeleton react component here prefix rc, body, and then description. So that is what allows me to just type rc and then it automatically fills all this in for me and then it places my cursor right here($1) so I can type in the name of the component and once again you can go through the video that I have on that, if that is something that you’re interested in. Now, inside of the workflow let’s also put in that heading so I’m going to just say workflow close off that h1. So now we have our three components but technically none of them are being called right now so let’s just make sure that they’re all working so we can come to app.js and let’s just call each one of the components so I can call discussion here, this is also just good practice for being able to repetitively create components and then call them from other files. So we have discussion rules and then workflow. And those aren’t going to work quite yet because we first need to import them. So we’ll import discussion from ./discussion and then let’s just copy this a few times, and then we’re going to have rules and then we’re going to have workflow. Let’s just make sure that that’s all popping up on the screen. So if I come over here. There we go, we see discussion rules and workflow. And the reason why workflow is bigger is because I threw that into an H1. But none of it matters were going to actually convert them into links for our router next, but this just shows that we’ve created the components and we can call them properly, so that’s a good first start. Now if you’ve never implemented the router before there are a few steps that we need to take. The first is we’re actually going to traverse all the way up to our entry point here. So this is going to be in index.js this is outside the components directory, it’s just going to be at src and then the index.js file. And what we need to do is we actually need to wrap our app component inside of a browser router. So if we come up here right below where we have ReactDOM we also need to import the routers so that this file has access to it. 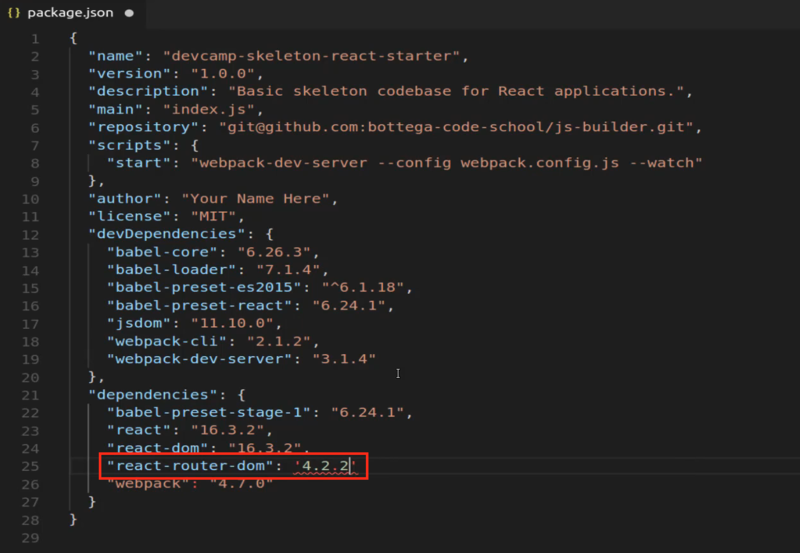 So I’m gonna import browser router which is provided from react router Dom I need to import the route and then the link from react-router-Dom, just like this. And now inside of here, I need to call that component. 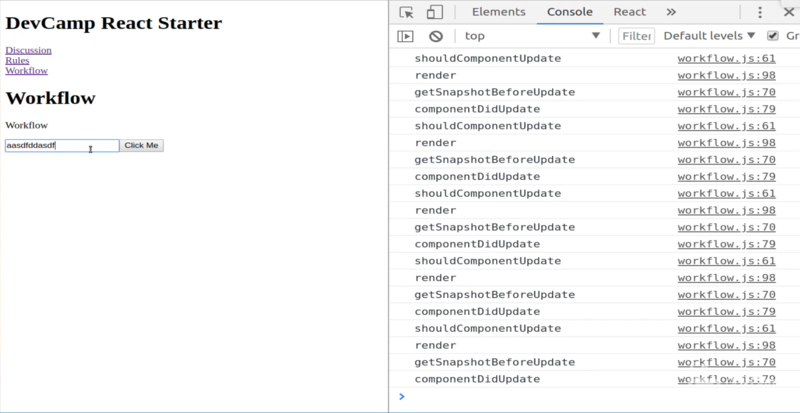 So this is a component that we didn’t build, this is a component provided to us from react-router-Dom if you went through their source code you’d be able to see that they have a component just like we’re creating our own components just like this. So we have our BrowserRouter component and this one we’re actually going to wrap the app inside of. So this is how we’re able to call this effectively inside of the file and have links, and when you click on one of the links it will go and show one component and hide the other component. So technically you could build all this kind of functionality yourselves. And I have gone through a really fun workshop from the creator of react-router-dom and he showed how we could build it ourselves. But I have found that it’s actually much more intuitive and much faster to just use the tool because it’s very lightweight and works quite well. So that’s the first part that is what we need to do by wrapping the entire system up in the router component. So now that we have that, now we can start building out a navigation component. 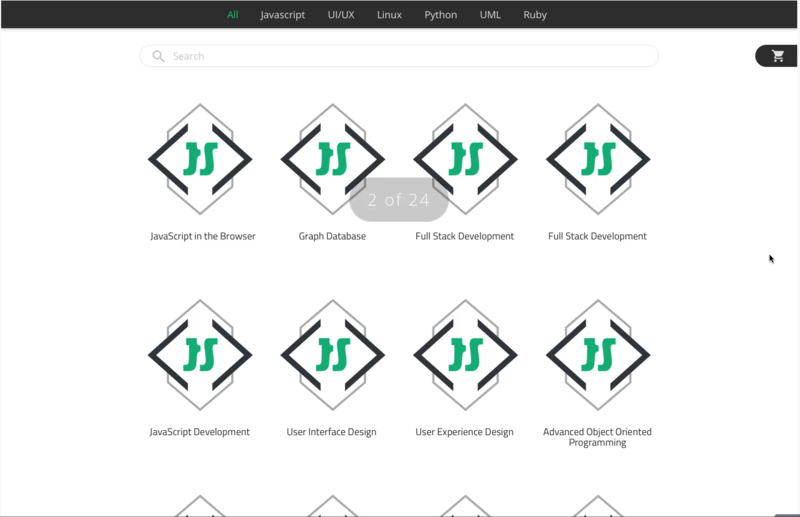 So as you may have guessed we’re going to go into the components directory and create a new file this will be called navigation.js. And inside of here I’m going to I’m not going to build out the full component so I’m going to simply use this as a functional component so I’m gonna say import React from react and then I need to import the NavLink from react router dom so I’m gonna say import NavLink from react-router-dom just like this. And now we’re going to create our functional components, so I can just say export default function and here inside of it I just want to return some jsx code. So this is going to be where we have all of our links. So let’s wrap all of this up into a div and then inside of here. I’m going to have a number of links so each one of them is going to be wrapped up in their own div and then once we have our first one we can really copy and paste it for the other ones. So let’s call a nav link component. This is provided by react-router-dom and then it also takes some props. So I’m going to say exact and we don’t have to pass anything to exact if we just say the word exact it’s going to know what we mean here. And this is going to be for our root route. So it takes props of to and so I’m going to say to just slash which means that if you go to a local host 8080 or whatever the url your application is the home page is going to be using this route. 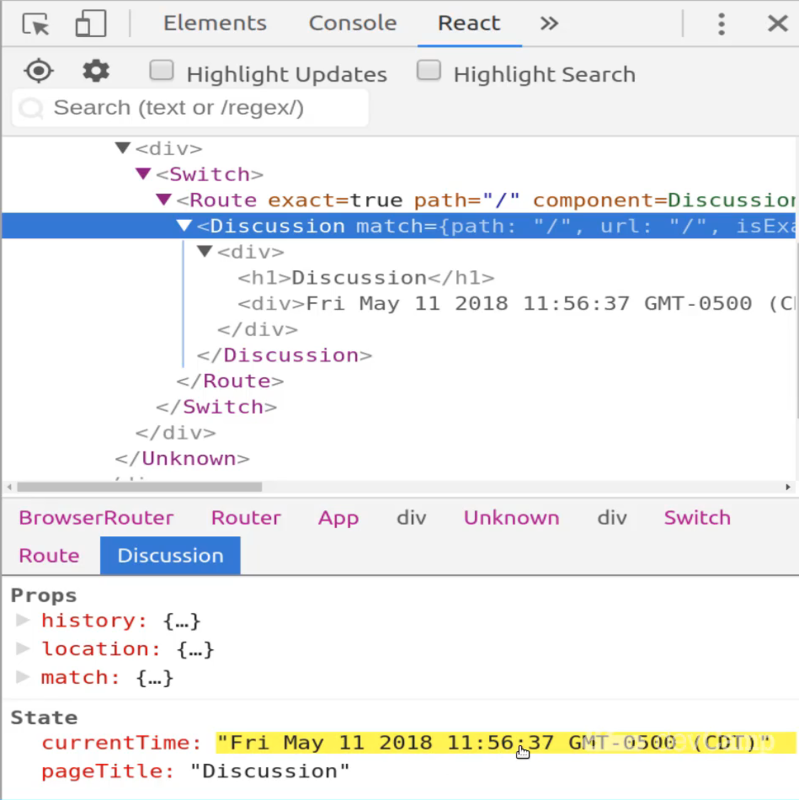 That’s how you can declare a home page with react-router-dom and I want the home page here to be our discussion component and then this is going to be closing off that NavLink and then that is all we need for the first one. So now we can just copy this for the other links. So we’re going to have a discussion and this next one is not going to be exact. This one is going to be pointed to we can just say rules. So here you can just slash rules change the text that you want to appear and then we just have one more. This is going to be for our workflow. And one thing I want to note here if you’re not that familiar with using react-router-dom pretty much everything that we have here is completely up to us in how we want to name it. So that is something that I just want to be very clear with. So when I say NavLink to workflow this could be workflow-asdf it really doesn’t matter, it can be whatever you want it to be. We’re simply defining what we want those routes to be right here and then we’re going to be able to wire this up inside of another component so we’ll call these. So when you click on one of these links it’ll redirect to the other component. And now having said that let’s actually go build that component. 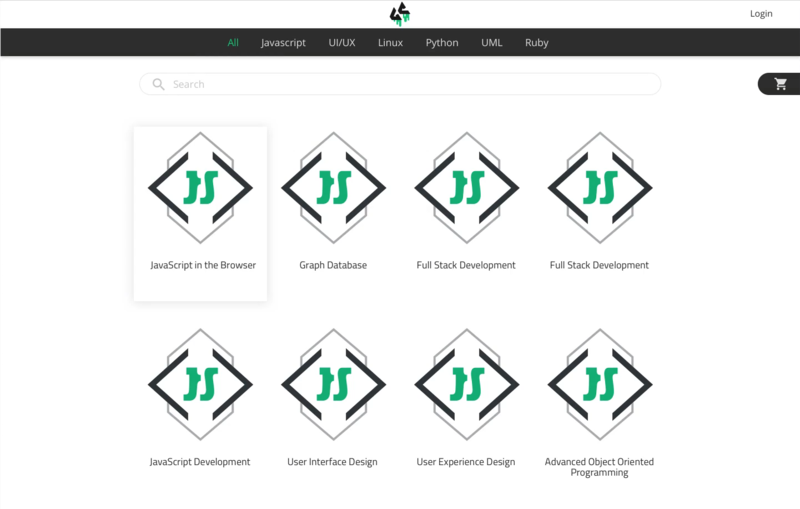 So I’m going to come in here create one called page-content.js and now we’re going to create another functional component. So this is not going to be a class one. So I’m just going to import React by itself from react and then we’re also going to be working with another library with the react-router-dom so I want to import with the curly braces switch and then route and this is from react-router-dom. 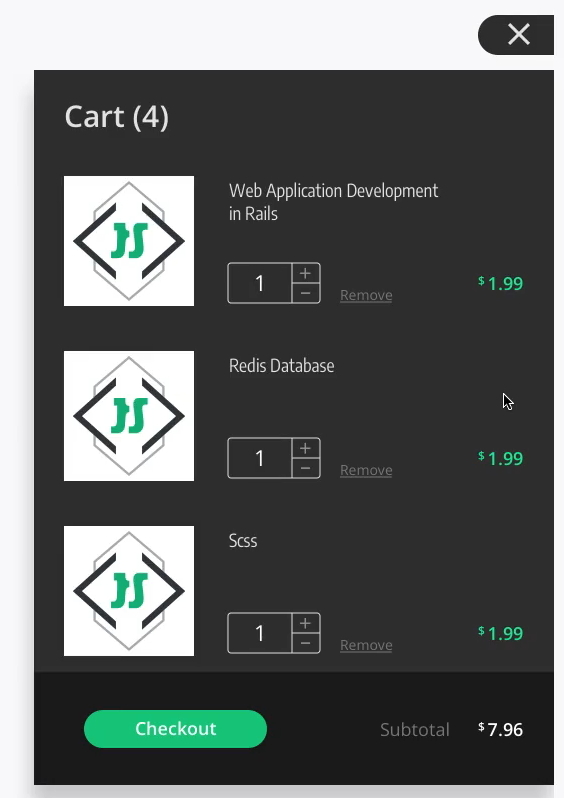 Then I want to import each one of these components we created here so we’re no longer going to be calling them from app.js but we are going to be importing them directly into the page content. So let’s come over here and I’m just going to paste those three in and that’s all we need to do for our imports and now let’s create our functional component. So I’ll say export default function and you may notice I’m not using an arrow function for these default functions and I’m also not giving them a name and it’s because whenever you say export default function what react does here is it assumes that you are wanting to create a functional component and then it’s going to look at the filename here and then when you import one of those files you can call it whatever you want and it’s going to simply wrap up this function here and it’s going to treat it like a functional component. So you can as long as you import the correct file name then you’re going to be able to use this. So in the last deep dive, I showed you a little bit of a different approach. And it’s mainly because I want you to be able to see all of the different options that are out there because as you’re reading tutorials as you’re going through documentation you’re going to see variations of how you can do things. And so I want you to be able to see all those options so that you can pick out which one you prefer. So now with all that being said let’s now return and let’s add some jsx so I’m going to add a div let’s close it off. And now inside of here, I want to implement what is called a switch statement, so I’m gonna say switch, and this is not switch like from the programming language perspective. This is something that is provided to us from as you can see up here react-router-Dom. So now with that let’s go and let’s build out these routes so I’m going to call the route component and we’re going to call it exact on each one of these because I want it to match the path exactly, and so when I say route exact path equals the root route and then I want the component to be discussion. So now we have route exact path. And then we want rules, this is going to call the component of rules and then lastly we have workflow and this is going to call the component workflow. Okay, so I know that was a lot of typing and a lot of setup but we pretty much have everything we need now in order to have a fully functional app with routes and multiple components. I know we haven’t really gotten to the main point of this which is the component lifecycle. But this is really necessary because the lifecycle isn’t really that important until you get to the point where you’re working with multiple components because the entire point of the lifecycle is that you can work with a component at different stages of it and if you only have one component you really for the most part usually only have one stage. So if you have multiples though you’re going to be able to see how this can work. So now let’s go into our app and now all we have to do is import the navigation component and then that page content 1. So here I can say navigation and then we have our page contents and then we can import them from up here. So import navigation from this is just going to be ./navigation and then the page contents from page-content. So that’s usually a little bit more work than I’d like to do without testing at all in the browser. So let’s go and see if we have any typos or anything like that. And it appears like this is working so you can see we have discussion loading up automatically, so right here if I click on rules that’s working perfectly, workflow’s working perfectly. So this is perfect, I like it. So you now know how to implement routing here if you didn’t already know how to do that. And then also work with multiple components so now that we have all of this we are finally ready to see how the component lifecycle works. So let’s come to discussion make sure it starts right there. And now let’s come to this workflow file now you would not want to watch me type out all of this I promise you that. So let’s come over here and let’s copy all of this. Copy all of that here. And let’s come down into our workflow file. I’m going to just select everything and in our workflow get rid of it, and then let me just paste everything from that file area. OK. So now we have everything here and this isn’t going to do a lot from a functionality perspective. But instead what we’re going to do is we’re gonna open up the console and we’re going to see the order that each one of these lifecycle methods is called. So that’s really the first stage I think in understanding the lifecycle method and that entire process is seeing the order in which they’re all called. So let’s come back to our localhost and click on the console. Now I want you to see that each one of the lifecycle methods I placed a console log statement there so that you’ll be able to see the exact order that they’re called. So now if I click on workflow here then you’re going to see that’s that’s fine, this is just a warning. But before you get into there look at this, the very first item that’s called is constructor. So that is number 1 and if you come back and look I added comments that you could see each one of these. So the constructor is called the very first time and so it’s that state and then you can see that I’m just printing out that this is when the constructor is called. Now the next one that’s called is getDerivedStateFromProps and you get this little warning but don’t worry it’s just telling you that a valid state object or noll must be returned and right now because everything’s pretty much hardcoded in there then that’s why it’s doing it. If we wanted to add let’s say inside of our state object we wanted to maybe add a page title or something like that. 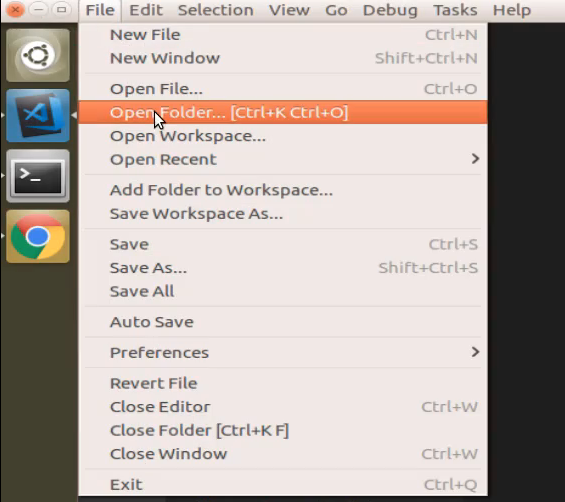 So I could say pageTitle: “Workflow” and hit save here. Now let’s clear our console and then if I click on rules and then click on workflow you can see that that’s now gone because now it actually is getting props so if you notice before there were no props because we weren’t passing a props to it you wouldn’t usually, and it brings up a good point. You’re not going to use getDerivedStateFromProps unless you’re actually passing props around. So that’s it’s good to know when it’s used but it’s also good to know the little warning and what kinds of errors you can get if you’re working with components that aren’t working with props. So you may notice we kind of went back in time because the component unmounted. So when we left it when we left the workflow and went to the rules page then it unmounted so it already showed that, then it called the constructor. Now, this is really important, this is one of the things I’ve seen that can kind of trip up some people who are trying to learn react. They think that componentDidMount is where they should place their state. So if you are wanting to set state, like we have state with this page title. They think “OK, I can set the state in the spot where componentDidMount is”. But as you can see this actually gets called fourth. So there are three other things that happen before this is going to fire. So if you try to place this state right here and let’s just do it, you shouldn’t believe me you should actually test things out. So if you go and let’s get rid of state here. So if we get rid of this and come down into the component did mount and let’s try this let’s try calling page title and we’ll add our workflow here. Now if we come down to the very bottom. So if I come down here and let’s say that I just want to put this on the screen. So I just want to say something like I want to have a paragraph tag and say this.state.pageTitle. If you’re watching this, raise your hand if you think that this is going to work. Because technically you might think if you listened to the name componentDidMount you may think that that would work and that that would be a good spot to put your state call but you can see we have a whole error and this error is actually quite descriptive especially for react. It says there is a typeError we cannot read property pageTitle of null. And the reason for this is that when the component is called when it is loading, we have our first call here which is a constructor. This is what happens at the very first time, the next one is getDerivedStateFromPromps which you are only going to need when you are trying to pull in props, right now we’re not trying to do that. Then the third call is to render. Now this is really important because what this means is that render happens before the mounting process happens so if you have anything that you’re calling inside of render you need to make sure that it is in either the constructor or if it’s props you’re bringing in and it’s in the getDerivedStateFromPromps, so that is something that is very important. Let’s come down here and let’s fix our errors so I’ll put our state back into its current working order and we are all good. Now if I click on rules you can see it unmounts go back to workflow and everything is working. Now you may notice that so far I’ve only talked about the mounting process and inside of that grouping we have the Constructor, we have getDerivedStateFromPromps, we have render, and then we have componentDidMount. So that’s good, but those are only four of them. And as you may have noticed we have eight of them or nine if you include component will unmount. So what all of these do is they all speak to the update process. So the update is something that’s very important because typically when you’re building out dynamic applications you expect there to be an update at some point or another. So here we have all kinds of different update processes. And I want to walk through how they work because it’s important to understand exactly what updating really means. So if I have some inputs and some buttons here and I want to show you a couple things. Where I have button with an onClick method and then it calls this handleClick function right here and then that’s it, it just says click me. And inside the handleClick, I have a console log statement and then I’m setting state. Now let me comment out setState here and switch back. And so what is going to happen now, I’ll clear our console out. If I press click me you can see it says button clicked. But as you may have noticed even though it says button clicked it doesn’t actually call any of these update functions, and that is critical to understand. When it comes to the updating process React is very efficient. And so what it is going to do is it is only going to call these update methods. If the component itself in its state has changed. So as you saw none of those got fired, but now if I uncomment that and now we have set state back in place, now watch what happened. So clear the console out now if I press click me, now we have all those methods. So we have button clicked which we had before then we have shouldComponentUpdate then we have render once again which is important to keep note of, then we have getSnapshotBeforeUpdate and then we have componentDidUpdate which is kind of like component did mount. This is like the updated version it is after the entire process has occurred. It’s rendered on the page this is kind of like the final State of the update process. But this is the full order of them and so this is something that is very important to know. It’s also important to realize that render is called in both the mounting process and the updating process. So if we switch back. 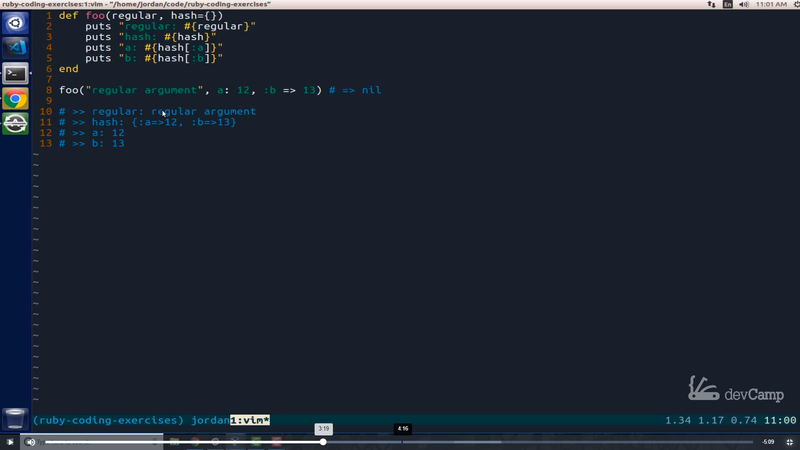 I also have the same type of implementation in place for input so that you could see that. 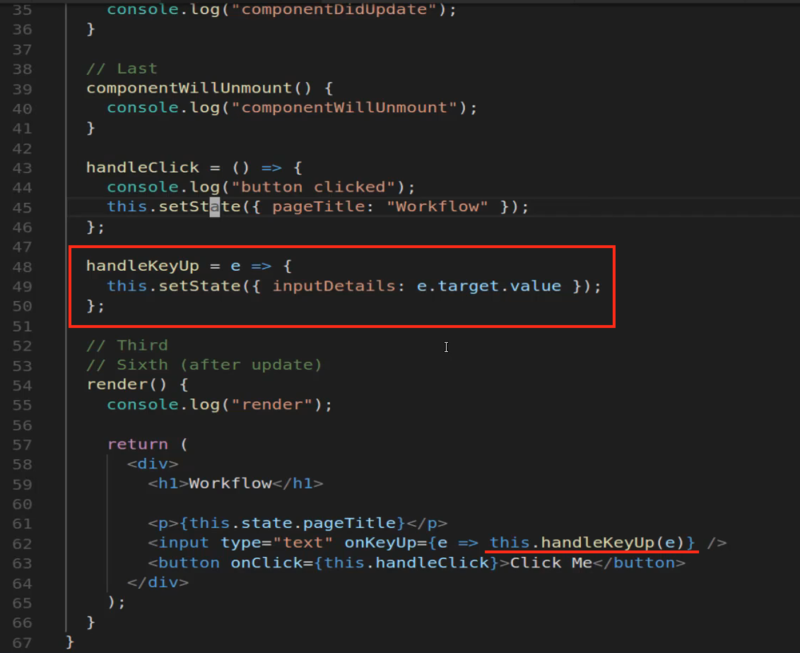 So I have an onKeyUp listener here that calls the handleKeyUp function and it passes an event so you can see here in this function that I update the state, I create a new piece of state called input details and I’m grabbing that target value. So now if I come here and I just start typing then you can see every time I press a letter on the keyboard here it is going to call each one of those update statements. So that’s really helpful because imagine a scenario where you want to build a live search feature kind of like what you’d see on Google or YouTube. The way that they were able to build that was with this exact process here where you have access to all of those update methods so you may want to call a search API. Every single time a key is pressed or every time a few keys are pressed and you want to pass in all of those values to it well you would do that inside of one of those lifecycle hooks. That’s why they’re so powerful and I know they can seem really confusing if you’ve never used them before, but hopefully now that you’ve seen this you kind of see that they are just some lifecycle hooks, they just give you access to perform some tasks at every stage of the components lifecycle from the very beginning so right when it’s first called which is what the constructor does all the way through until you leave and that’s where the unmounted process occurs. So as I leave the workflow you can see it calls componentWillUnmountand where this is incredibly helpful. We’re going to walk through the other a couple of features of this project shortly and where this is really helpful is that imagine that you have some kind of live process happening. So you have something where maybe you have a timer, maybe you have a live data feed you don’t want that happening in the background so componentWillUnmount allows you to have one method that you can be completely confident that as you’re leaving and so as you’re moving onto a different component changing pages anything like that you can perform all of your cleanup all in one spot and so this is very helpful. Now with all of this in place hopefully this makes a lot more sense now. And now let’s go and actually build something practical because hopefully, this helps to clarify it in your mind. But I think it’s really helpful to build out real functionality so we’re going to add some live behavior to the discussion component and then we’re going to see how we can use a couple of the more popular lifecycle method hooks in order to make that possible. 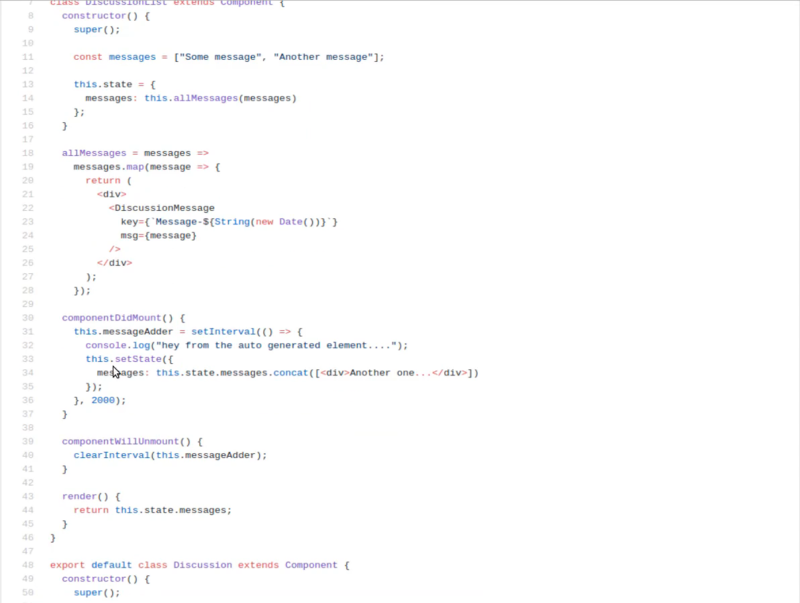 So we’re going to finish off by let’s close out each one of these components just to make it clear what we’re working on and inside of our discussion.js file. I’m going to build out three full components here. We’re going to have a discussion a discussion list and then a discussion message. Now I think we’ve gone through several times on how you can create a component and call it from a file. And so I’m not going to separate these out into their own separate ones just because I think it is very beneficial to see exactly what is happening here. 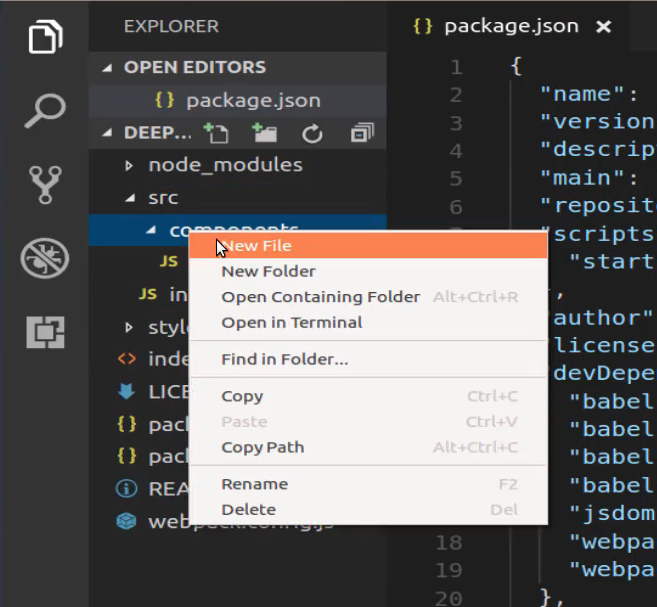 So you’re going to be able to see multiple lifecycle methods in different components and you’re going to see how they can all interact with each other. but that’s technically not going to work. What we need to do is wrap this all up and convert it into a string, so that is going to give us the current time. so that is our page title and it’s in an h1. and now what I can do is I don’t have to call this.state anymore. I can just call pageTitle and treat it just like a variable and you can see that this is still working. So this is really helpful because imagine that you had 10 different variables you wouldn’t want to call this.state in each one of them, but instead, you’d want to be able to simply call them by their name. Now you can also add on to this so I could say pageTitle and then I could also say current time because that is available in our state and then down below I’ll create another div and inside of this, I’ll say this. I’m sorry I don’t have to do this now, now I can just say currentTime I would have had to do that if I wouldn’t have wrapped it up with that object deconstruction. So now if I save this you can see it’s showing the current time. So now let’s build out our little timer function. So what I want to do is every second I want the time to update on the page. Right now it’s just hardcoded. Now if I hit refresh then it changes the time but you wouldn’t want to have to ask your users to hit refresh for that so let’s see how we can build this out. So from a lifecycle perspective, we have a constructor and then down below what we’re going to do is once it’s loaded then I want to start a timer. So how do you do that? Well, if you remember we have a very special method here called componentDidMount so I can say componentDidMount and we are not going to pass in any arguments or anything to it and let’s just log this out first. So let’s just say I want to log this out and say ‘Mounted component for discussion’. Hit save and let’s just see if this works, and yes. So if I click on rules and then click back on discussion you can see it says mounted component for discussion. so it loaded so that we know that this function is working I’m gonna get rid of that console log statement. 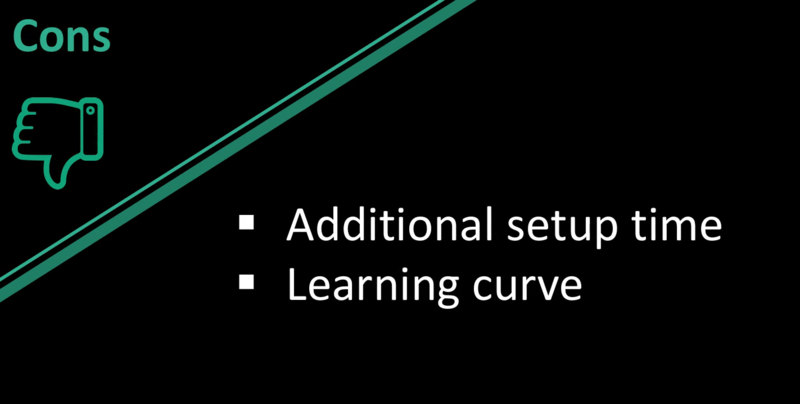 So now let’s actually build out the interval function so I’m going to take one approach first and then I’m going to show you how using lifecycle methods you can improve it. So when it comes to learning lifecycle the one thing that helped me the most was actually seeing how to do it wrong and when I saw how to do it wrong it showed me the importance of implementing the correct types of methods, so hopefully that approach works for you as well. So I’m going to create a timer so I’m gonna say this. or actually, before I can do this set state I’m going to set the interval. So let’s set the interval, and I’m going to pass the interval a function which is what you need to do in order to get a timer going and make sure you have your curly brackets going just like this. So inside set interval what I want to have happen here is I want to set the state so I’m gonna say this.setState and inside of this I want to update the time every second so I can do that by saying current time and then wrapping it up just like we did up top so I can say string new Date. And that’s going to give us a new time and then I want to do it every thousand milliseconds which also means just one second. So I’m going to save this and let’s see if this is working, and yes it is. So right here you can see what’s going on here is giving us our time and then every second this is updating. 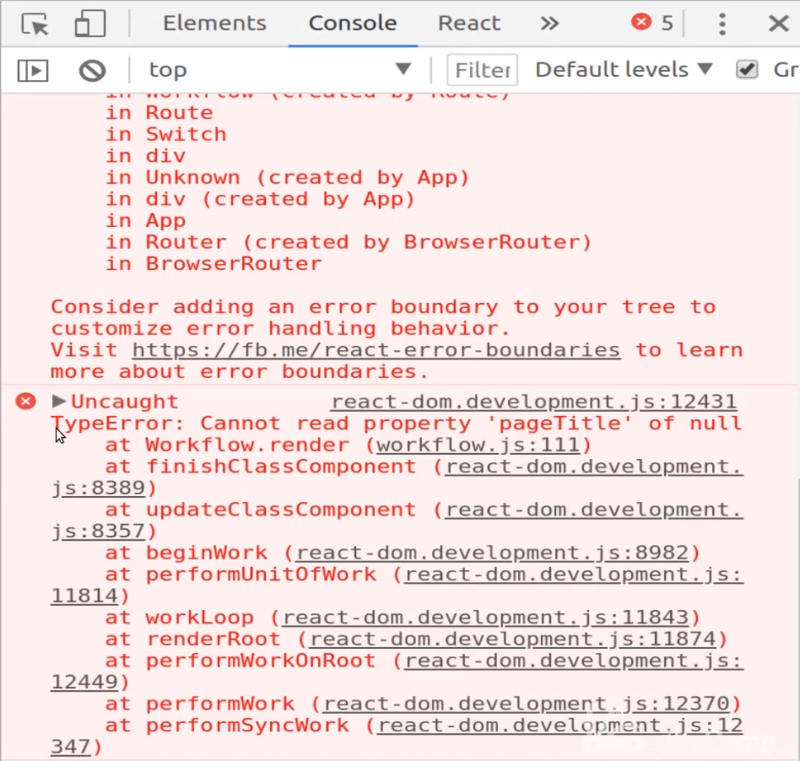 So if we click on React this is going to give you some helpful insight into what’s going on and also show you how performant the entire system can be. So inside of the switch statement, we’re going all the way down and now we finally have our timer. So if you notice how this is changing you’ll also notice how the state is updating and it highlights every time that updates(once a second). This is changing but one thing that’s pretty cool is in the entire application there’s only one thing that is actually changing and if we were to add a component will update function so if we did something like this. So let’s go and grab one of those so in updating if we wanted to put something like componentWillUpdateand we wanted to put that inside. If you want to reference this also you can go in the workflow so you can see componentDidUpdate we can copy just this entire line and you can see that this is also firing automatically. So if you wanted to trigger anything inside of the update process then you can also do that here. So now if we switch back and come back to the console you’ll see that every second component is updating. So this is pretty cool but there is a bug and so this is what I want to show you. We’re going to be able to use the lifecycle methods in order to get this working. So with this componentDidMount here what I’m doing is I’m accidentally causing a pretty nasty memory leak right here. Now it’s not that bad because we are just adding and calling the new date every second so that’s not horrible. But imagine a scenario where you have like a chat feature and that’s kind of what we’re mimicking here we have this discussion. Imagine that each eats each second a new chat message came in and also in the project I have this even more built out so I have some more components that you can reference. But we’re almost at an hour into this deep dive so I don’t want to take up too much more of your time but I do provide other examples in there but right now just imagine that with each new second you get a new discussion post. Well if you are calling an API and you have that live feed of data that’s fine for when someone is looking at this. But the problem is what happens when they go and they navigate to some other spot of the app? So let’s add a console log statement inside of here so I’m going to come and lets inside the componentDidMount let’s see the best spot to put this, will actually let’s put it right inside of the set interval here, so I’m going to say just log and we’ll just say new chat message or discussion post or whatever you’d like to call it, and so now you can see that we get a new chat message every second. We can remove our componentDidUpdate call here since it’s really just kind of duplicating what we already had and so now we can see our mimic chat messages that are coming in once per second. Now, watch what happens if I click on rules here, you’re going to see we get a warning. So it says can’t call setState on an unmounted component. So that isn’t that clear, but then read the next sentence it says this is no-op, but it indicates a memory leak in your application and that is what’s happening because look at this, our chat messages are still coming in, that is not good. So what we’ve effectively done is it’s almost like all of those processes in the client they’re still occurring, we’re still getting those chat messages and it’s because the component is still technically active. So it’s still calling that so even though we’ve left the component and it’s hidden, or it’s it’s not in the DOM anymore, this set interval process is still occurring. That is a problem and this is one of the most critical things to understand when it comes to working with lifecycle methods. So I’m going to show you how to fix this and we’re going to be able to use another lifecycle method in order to do it. So here what I’m going to do is I’m going to set this entire process this setInterval process in a variable. So I’m gonna say this.liveTime which is not a reserved word or anything this is just a variable that I’m adding to the component. So now it’s stored in the variable. Now if I save this everything still works the exact same way. So if I click on discussion then you can see everything is still working on our chat messages are coming up it’s logging them, everything’s working there. But now watch how we can fix this, so now if I come down here and I say componentWillUnmount just like this. What I can do is I can stop and I can perform all the clean up that we want to do. So right here I can say clear interval which is a way you can clear interval and then say this.liveTime. And so what this is going to do is now whenever React realizes that we are clearing the component that it’s unmounting it’s going to call this function, this function isn’t going to stop this process. In an application where you had a live data feed coming in you could simply call whatever you need to in order to break that connection. So right here we are just calling clearInterval it is clearing it and also just so it’s clear you can use this process to call an API. I wouldn’t do that every second because that could be very bad from a performance perspective but let’s say every 30 seconds you want to update a report on a dashboard or something. You could do this exact same thing right here, you could set the state, you could call that API, you could bring the data in, and then you can use clearInterval in order to clear that process out. 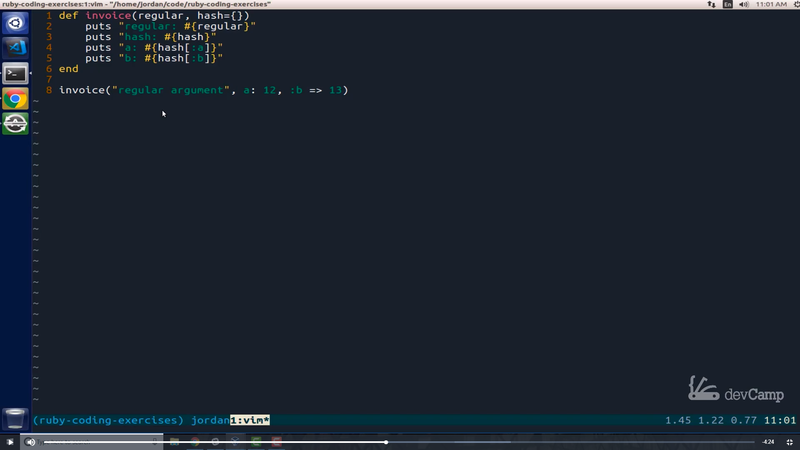 That’s why you needed to save it inside of a variable and save it to the object, so now let’s see if this is working. As you can see we have everything working here, we are at new chat message number 67, everything there appears to be working. Now if I click on rules it stopped, that means that everything worked. So this is how you can leverage lifecycle methods not just to help spawn processes but also to help clean them up and to perform the kind of work that you want to do. If you’re wanting to just really make sure that you don’t have a performance issue. So this is something that is very critical whenever it comes to working with lifecycle methods. If you have any kind of live data or any kind of automated process that’s running in a component. You just need to make sure that you clean it up and the componentWillUnmount lifecycle method allows you to do that. So this is the full process so right here you can see that we’re using four of the lifecycle methods we’re using the constructor componentDidMount, componentWillMount, and render. We’ve seen how you have a few more, I believe eight or nine total ones to use and you’re not going to use each one of them each time. So there will be many times where you only use a couple of them you may have plenty of examples where you’re not even going to use any of them besides a constructor and a render. But whenever you need to add some more advanced behavior such as starting up a process or cleaning it up then these are incredibly helpful. My goal in this entire deep dive was to really strip away some of the more confusing aspects of lifecycle methods and hopefully make it seem more straightforward and I hope that I did that. Now, if you still have questions or you are still a little confused on it then I highly recommend for you to go through the project that I created because I did add some additional examples if you go on components and you click on discussion I show how you can have multiple components all here in the same file. And some of the other components so I created a discussion list one and a discussion message and I showed how you can start that same process. I went through and built out an automated process for creating messages and adding them to an array and then showing those on the screen, it’s identical to what we did with our interval. But if you feel like you still need a little bit more clarification then I recommend that you reference this and you go through this example because it’s going to show you how you can have multiple components and how you can perform that same process. Notice here where we’re doing exactly what we did in our tutorial, where we call componentWillUnmount, we clear the interval which in this case we’re clearing that message adder that I showed you. And then it’s going to perform the exact same process that we did. So I hope you enjoyed it, I know that was a long guide but I hope that it helped to really add some clarification for the entire lifecycle process method inside of react for you, and good luck with the coding. 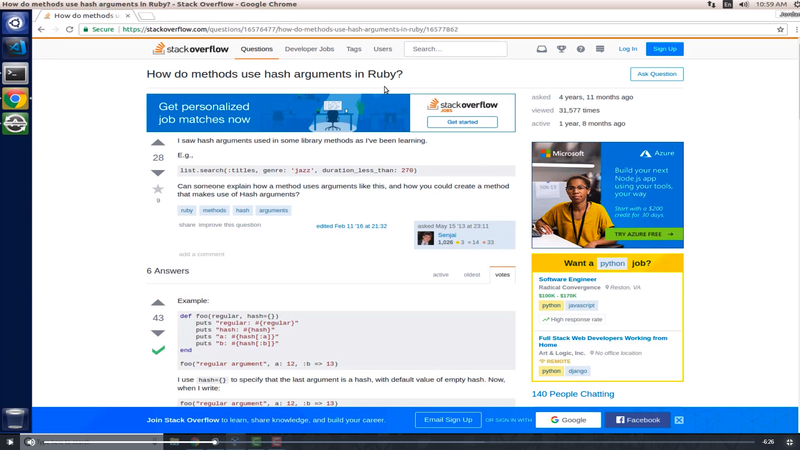 If you’re a new or aspiring developer you may have come across that terms foo and bar whether you’re reading a post on stack overflow or listening to some type of webinars or anything like that. And if you’ve never seen those terms before they might be kind of confusing you might think that those terms are reserved words in a specific language or they they actually represent something. But what I want to do in this guide is tell you that there is no such thing as foo and bar. I want to dispel the myth that you need to use those or even to know really what they represent and instead I’m going to show you that there are just placeholders and so hopefully they’ll help prevent any confusion as you go along in as you see them on different posts that you’re not going to think of what those words represent but instead you’re going to see that simply use there as placeholders and the way that I’m going to do is I’m going to take some examples that I found on stack overflow and then I’m going to simply change them up. And if you’re a more advanced developer so if you’re going through this and you know that foo and bar don’t really mean anything then I still think that this is a good exercise for you to go through because what I’m going to walk through is not just showing that foo and bar don’t i’m also going to show how I don’t use them at all when I’m teaching the students I’ve taught over 35000 students over the past five or six years and I never use the terms foo and bar and I don’t think that advanced developers or teachers should use them because I’ve seen through the years they cause a lot of confusion. And so instead I’m going to show you what my approach is for creating placeholder functions. “So with all that being said let’s jump into some code examples”. Now notice that the method that was created and you don’t have to know Ruby to know what’s going on right here this is just a method and the developer called this foo and then down here they are calling this foo method so let’s just show that foo as an actually mean anything. So what I do whenever I’m teaching or where ever I’m showing a student or another dev. An example I never use these kinds of terms but instead I try to pick out something real life that actually has a meaning. So I’ll do something like say let’s call an invoice method here. So down below we’re not going to have foo. We’re just going to say invoice. This could be anything but an invoice is much easier to understand. You could call this anything you want. A lot of times all use a greeting method or anything that makes a little bit more real life sense. And then you also have these other words here you may think that regular is a reserved word but it’s not let’s just use something that everyone’s going to know is not a reserve word. So here I’d say something like. Company name and then down below in the example I would say company name and change it up here as well. Company name and then coming down. I can say this is Google. So so far so good. And now if you want to test us out we can run it again. So just run this code and you can see everything still works except now we have some output that is a little bit less abstract we have something where a student when they’re looking at this is probably going to realize that the words like invoice. and company name are just things that we’re making up they’re not some kind of special coding construct. And if you really want to get even further into this whenever I’m using an example I really don’t like using terms like a and b. Those seem like those are also a little abstract too. So here I might do something like say invoice number and then same thing over here. So invoice number here and then come down and when I’m calling that this is now invoice number and instead of b I might go with something like Total and then I can come up to this example. Switch it out for total run this code again. And now you can see that we are getting the exact same type of output. So the same concept that was trying to be explained is still in place. We’ve created a method we’ve used the kinds of principles that are looking to show which is to show how to work with a data structure as an argument and then how to call those values. But instead of using terms like Foo or Bar or A and B instead what we’ve done is we’ve created more of a real life scenario. And I think that this really helps to clarify that. So if you’re a developer a more senior developer and you’re teaching your developer you’re more junior developers how to learn then this type of approach is going to make a lot more sense to them. I’ve seen this over the years with the students that I’ve taught is when I have been able to use an example that truly made sense to them something they could relate to. They were able to understand so much better than if I used abstractions. And so this is what I have personally found very helpful to me both when I learn and also when I teach others. I hope you found those examples helpful. Whether you’re a new developer and now you realize that foo and bar don’t actually mean anything they’re just placeholders or if you’re a more advanced instructor or a more senior developer then you’ll have a little bit different approach when you’re trying to explain code. And it’s not just me who thinks that foo and bar need to die. If you look at some recent Twitter posts and actually the inspiration behind this video I saw where DHH, the creator of the rails framework, who is definitely pretty much as senior of a developer as you can get has shown that he thinks that we need to stop using terms like foo bar and baz and like he says I’m just going to say it. I hate foobar and baz as prototypical variable names and it’s time to change and I believe that completely I think that not only should our code be expressive so when we’re building a true production application we’re very careful with the variable names and the class names and the method names that we pick out when we’re using these kinds of prototypical examples to show whether it’s for instruction or whether it’s simply for example. I think it’s just as important to use names that are descriptive of what we’re trying to impart. All of us have a wide ranging set of tasks that we have to get accomplished on a daily basis and being able to properly manage those can be quite challenging. And so what we’re going to walk through in this guide are a number of potential solutions for how to build out a task management system. The reason why I’m going to give you multiple options is because it’s been my experience that I might go with one approach for a few months or even a few years and it works well. But I’m continually adapting it because everything in our lives change and we ourselves change and we adapt and so, therefore, it makes sense that the way that we manage our day to day tasks should also adapt over time. 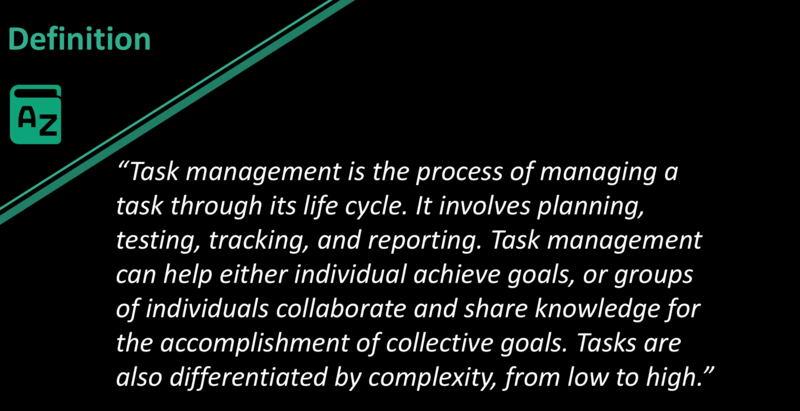 Now the very first thing we’re going to do is we’re going to talk about the primary goal of being able to manage tasks. and then we’re going to walk into the formal definition and see what this represents and that’s going to help lead the way for what our system is going to look like. 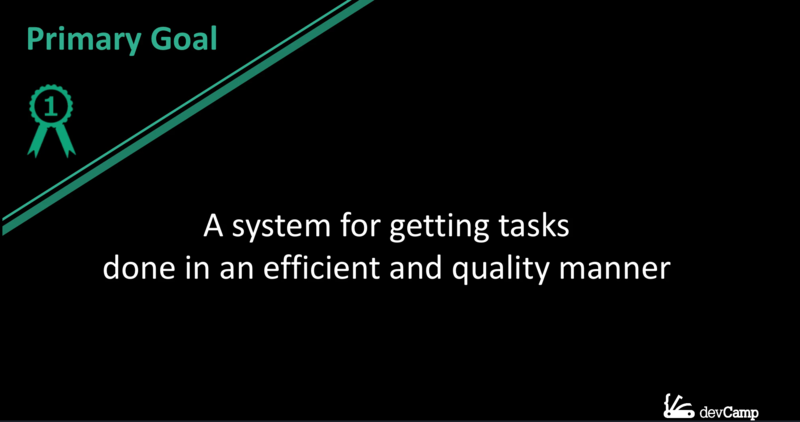 So the primary goal for task management or building this type of system is that it is a system for getting tasks done in an efficient and quality manner. And I picked out the wording for this in a very intentional way and it’s because there are three components that we can analyze here. First is that tasks have to get done. 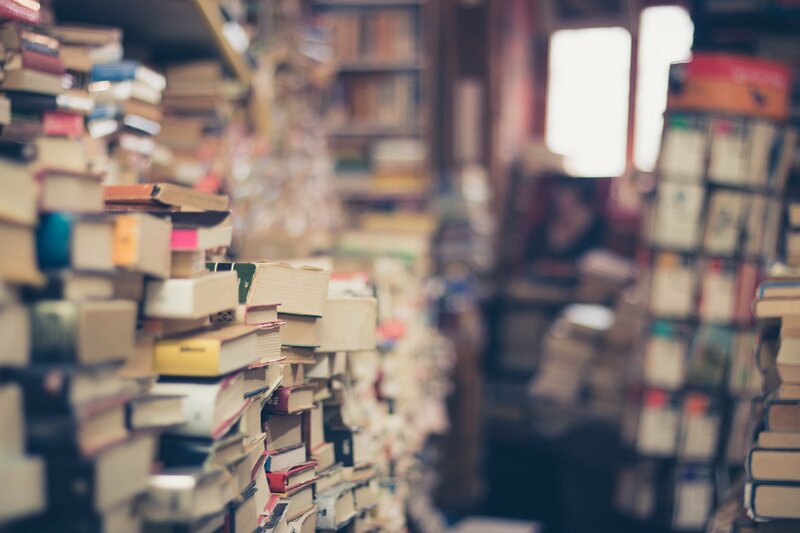 So that may seem like a common sense kind of approach, however, how many tasks do you have that have simply been sitting in your inbox to get done for a long period of time and you’ve procrastinated through them and they simply haven’t gotten done. I know that that is something that I’m definitely guilty of. And so the very first item on the agenda with any task management system is that it helps you achieve this first goal of going from start all the way through finish on a task. Now some of these tasks might be very simple it may be as easy as clearing out your inbox or it could be a task that is actually something that lasts for six months such as building out an entire web application. So the task size can vary but the goal is always the same and that is that you should be able to take it from start all the way through finish. Now we have two other components here. The next is that we want to do things in an efficient manner. So this means that we limit the amount of wasted time and resources and our system should go and it should help us achieve that goal. And then lastly these items should be done in a quality manner. So with these three components completion efficiency and then quality if you can build your system to be able to help you achieve each one of these goals then you’re going to be in very good shape regardless of what the tasks are, those are three components that you always want to get done. Now I’m going to go into the definition from Wikipedia not to bore you but instead to help give us a framework for what a task management system really should contain. 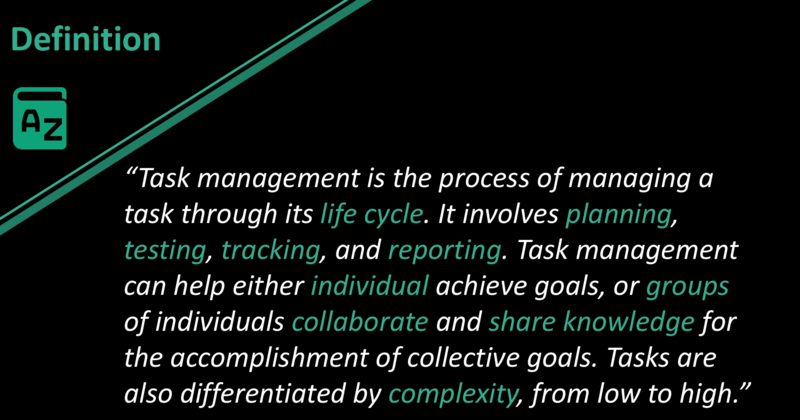 and those are life cycle, planning, testing, tracking, reporting, individual goals, group goals, collaboration, sharing knowledge, and complexity. And the reason why I picked out these words is because they go into all of the different elements that a task management system should really contain. Now a few of those are optional. So if you do not work with a team then collaboration and sharing knowledge may not be a big priority and so whatever system you use won’t have to have those components. But in general each one of these key words is necessary in order to build out a fully functional task management system. So now that we’ve taken a high level view of task management. a properly structured task management system is great because it helps to provide structure and organization. 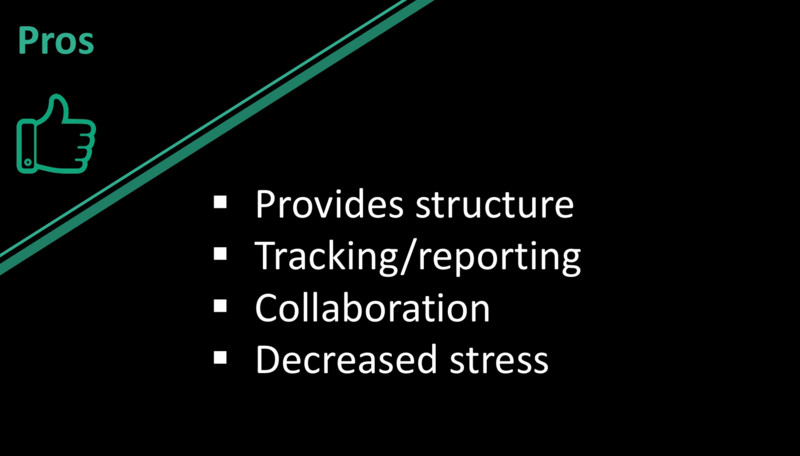 It allows you to perform tracking and reporting. It allows for collaboration and one of my favorite pros is that it decreases stress. Research shows that one of the top causes for stress and anxiety in individuals is uncertainty. And so if you as a individual have a high level of uncertainty on the tasks that you’re working on that is going to be a very significant cause of stress in your life. And so what a task management system should do. One of the top goals is to provide a level of structure and also to decrease uncertainty. So when ever you have been able to properly outline and structure your goals on a daily basis that should give you a level of certainty because it tells you exactly what you want to get done on a day in day out basis. Now that we’ve talked about the pros let’s mention a few of the cons. One is that there is additional setup time there is no way around this. If you want to properly implement a task management system you’re going to have to dedicate and allocate the time needed in order to build it properly and then also to maintain it. I personally spend anywhere between 10 and 30 minutes a day working through and planning out my activities. And this is very common in pretty much every task management system I’ve ever implemented. And so you are going to have to have that time sliced out of your day. Now also there can be a learning curve. So depending on the type of system that you want to implement there are various things that you’re going to have to learn in order to build it out properly. I do not think that either of these cons detract enough in order to say that you shouldn’t have some form of task management system and what we’re going to do is we’re going to go through three options and these are three systems that I have personally use throughout the last few years and each one of them has proven to be very effective. The three that we’re going to talk about are going to be daily task journalling, Kanban and then a traditional to do list in the first case study we’re going to go with is daily task journalling and the example that I’m going to use is from a company called Best Self Co I’ve use their service for a while and it is a system where they print and structure an entire journal. This small book and they send you a new one every 12 weeks. It is a paid service. But each one of the components that are included can be something that if you do not want to pay the money but you still want to implement daily tasks journaling as your system then you can do all of this yourself completely for free. I’m simply going to walk through their structure as because there were a number of benefits and I got quite a bit out of it when I was going through their system and every daily task journaling system is a little bit different and so what I want to do is include some of the more popular elements and then you can always pick and choose which one of these items you can include into your own daily routine. What they had is that you always start off the day listing off what you’re grateful for. Now this is not something that they invented. In fact I’ve heard a number of popular entrepreneurs such as Aryana Huffington who does this exact thing every day when she wakes up. She lists off three things that she’s grateful for before she has opened her phone to look at e-mails before she’s done anything else in her description of the process was that it allowed her to start her day with the right mindset instead of diving right into any tasks that could potentially increase stress and anxiety. It instead allowed her to start with the mindset of being happy and being able to be thankful for the best parts of her life. And then if you look down at the very end of the list you also do the same task. So at the very end of the day you list off three things that you are grateful for. Research has shown that by doing this at the end of the day it actually helps to decrease anxiety and stress and promote better sleep. So inside of that list we have a number of other elements such as time boxing tasks, setting a primary goal, setting up the daily targets, talking about at the end of the day what kind of improvements you could have made to that day, and this is one of my favorite components about the daily tasks journalling is you don’t simply treat your To Do List as something that you either achieved or you didn’t achieve. So if you had 10 items on the to do list and you only got through seven of them instead of treating that like a failure because then you’re going to personally feel like a failure. This approach looks at the list and it analyzes any improvements that you could have made. Imagine that you were in a sports team and your team just lost. You don’t treat the entire season as a loss at the very end of the game you get with the coach and you walk through how you could have improved that day. And the thing that I love about this is I’ve seen many times in my own personal life where I didn’t take this kind of approach where I didn’t look and see how I could improve what I did that day. And the issue that I ran into was that each day that I didn’t do that, that I didn’t try to walk through and analyze how I could improved, those issues carried on. So in other words if I procrastinated for example and I didn’t complete a number of tasks because I simply didn’t feel like doing them instead of analyzing that and seeing how I could improve at the end of the day, that same procrastination kind of attitude was prolonged and it went into the next day and the day after that. And I don’t know maybe it’s just my own personal experience. But I think that there are other people out there who experience the same exact thought patterns and just as important as looking over your day and seeing how you could have done better is also looking over your day and see what your big wins are. So this is something where you can brag a little bit to yourself on the things that you were happy with. And so the way that the Journal actually looks and this is a verbatim screenshot or a picture of my journal when I was going through it. On the left hand side there you can see that all of my tasks for the day were time boxed and it went from 6:00 a.m. all the way through 9 p.m. So right there I listed out every single task that I had to do and this includes your entire life. So if you are in school or if you are working in a job you don’t simply list the elements that are related to your school or work, instead you list everything out. As you notice I included my workout, I included my general tasks, I included lunch, and all of those elements and as you can see every moment of the day is spoken for and that is something that is very important because one thing that I’ve experienced that if I have a portion of my day that I have not allocated for some task then when I get to that time then there can be some confusion or it can even lead to procrastination or me not spending my time in an effective manner. Now one process that I found incredibly effective was the notes section on the right hand side there. As you can see that lined up with a number on the tasks side. They have a task on the left hand side and then they have some notes on the right hand side. I started to notice a trend where I would work through various projects and then when it came to the next day it would take me a little while to pick up where I left off. So say it was a code project I may have had a fantastic day the day before and building out a feature but I didn’t know where to start on the next feature. And so what I use the notes section 4 is I simply give myself a few key words there. As you can see at the very top I was building out the daily smarty web application and on this particular day on the 24 of 2017 the next feature that I knew I was going to have to build out was the Twitter authentication system for daily smarty. What that was enabling me to do was when I started to write out the tasks for my very next day. I instantly knew where I needed to start with. So when I woke up the next morning and I started working on that daily smarty application I didn’t have to go through and look at the code that I pushed up the last day and look at where and then try to decide where I was going to start. Instead I simply was able to look at those few little notes I wrote down and I instantly knew where to start on the new application and so that is something that’s very helpful. And I’ve seen that help not just myself but other developers that I’ve worked with. Being able to help yourself out because as much as you may think at the time that you’re going to understand exactly where you left off and you’re going to be able to just start the next day running. If you don’t give yourself that information and give yourself some hints on where to start off then you’re going to end up wasting time simply going back and trying to figure out what you need to do for that next day. So make sure that what you’re trying to achieve is specific in that you’re also helping yourself out as you go through and complete the tasks. Now on the bottom on the left hand side and the right hand side you can see that that is where you list off what you’re grateful for both when you wake up and when you go to bed. Moving to the top right hand side. Every day has an overarching main goal for the day. So you try to pick out your one top item that simply needs to get done something that is very popular in the goal setting community is making sure that you properly prioritize your goals. So if you’re working for a company and you have one feature that you need to build that day make sure that that is your top goal and also make sure that you start that day by attacking the most important item. So make sure that you’re prioritizing not just your goals but you’re also prioritizing your time in a way that reflects that. Now moving down a little bit you can see that the other item is the target list. So you have your goal you can think of that as your strategy, it’s what you want to get done that day. Now your targets, this can be a tactical approach. So this can be a set of to do items that could list out the steps that are needed in order to achieve that goal. And the book gives a few little hints such as right there in the parentheses where it says what we’ll make today a win for you? That is very important. There are many times when I haven’t been good with setting up a task management system where I didn’t properly establish what a win for me that day meant and so I could have had an incredibly successful day by most standards. But because I didn’t establish that in my mind and I didn’t write down what a win looked like for that day when the end of the day came. I would be a little uncertain and therefore stressed and anxious on if I was good that day or not. And so that is important to list that out. So at the very end of the day you can look at it and see if it was a good day or is a day that you need to improve on. Moving down the page you can see the next group of content list out the lessons that you learned that day. So say that you procrastinated on a task don’t simply say oh I procrastinated on this task list out why that occurred. Imagine that you are coaching somebody else so imagine that you have a student and you are trying to help them be as efficient and productive as possible. And you saw that they procrastinated that day walk through the causes of the procrastination. Was it a topic that was intimidating for you? Was it something you needed more information on? Analyze the cause of it and then that can help lead you to improving on it. So in lessons learned don’t simply say oh I was bad at x, y, and z this day instead say I struggled with these tasks for this reason and this is how I think I could improve on that tomorrow. Moving down to the very last item. This is the fun one, this is the set of wins for the day. Make sure that you always list out the best parts of your day and how you were successful. Because that’s going to help give you confidence and it also gives you a nice log where you can look back and see all of the wins that you had. 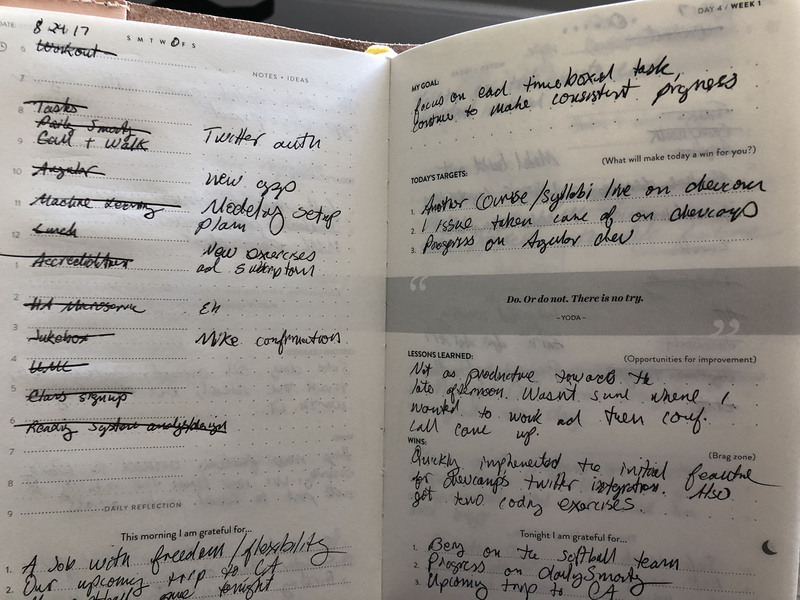 So any time that you built out a feature successfully or you understood a topic that you’re studying this is where you should list that in your daily journal. And that’s my approach for using daily tasks journaling. If you are someone who really enjoys working with pen and paper this can be a great option for you. One item that you may note is that this is not the most collaborative approach. So if you’re working with a team on projects this by itself is not going to be the best option for you. This is something that is more focused on helping you as an individual. 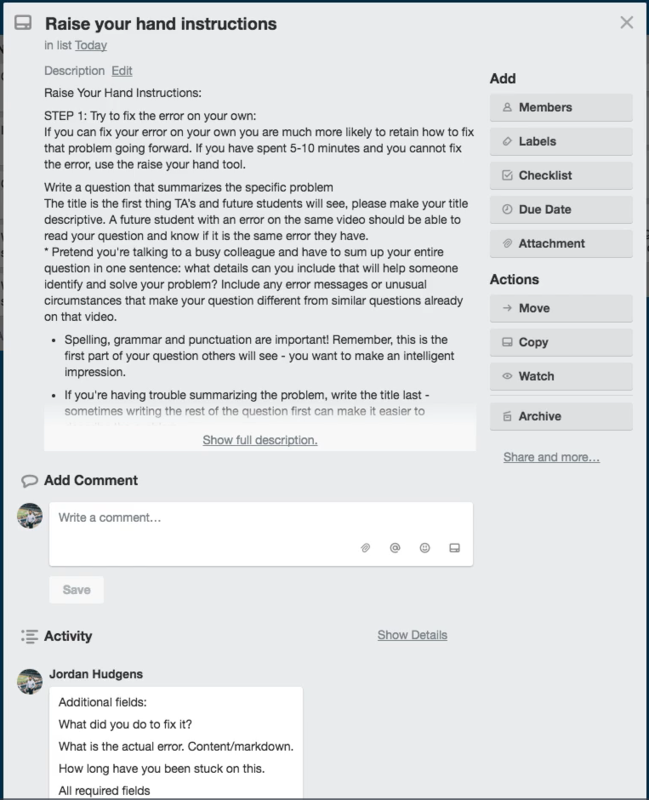 Now we’re going to move on to a task manager system that you can use as an individual or in a group in collaboratives setting. And that is a Kanban approach and a Kanban is a project management methodology that’s been used for several decades and has become incredibly popular in a number of different industries and so we’re going to walk through a few variations of that. We’re going to see how we can use it for daily status tracking, for collaboration, how we can use it for projects both for yourself and for groups, and also how you can leverage this kind of tool for adding metadata and other kinds of associated content, and helpful items like that into your daily workflow. 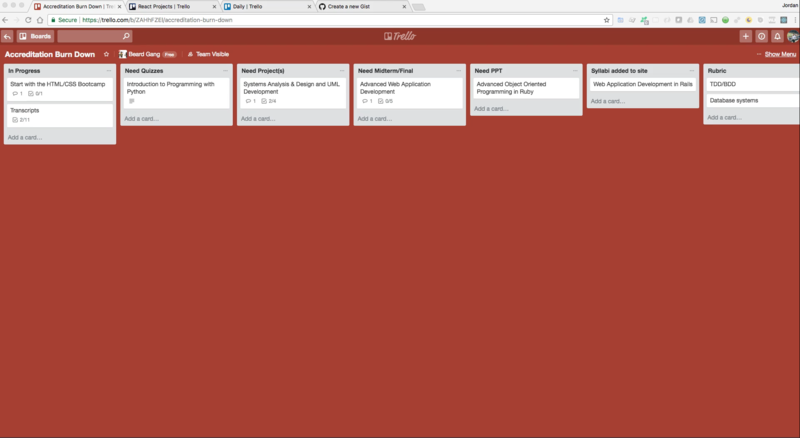 For this walkthrough we’re going to jump into the browser and we’re going to work with the Trello software. And so Trello is a free tool to use, they have paid options. If you’re working on a small enough team then it is free and especially if you’re just using it for your own purposes then it’s completely free and you can see a very different approach here compared with the daily task journalling. And in addition to that we’re going to go through three examples. I have a number of Kanban boards that I work with individuals on and also that I work with just for my own personal use. And so I’m going to show you the approach because it is different for each one of these boards. The first one I’m going to show you is the traditional Kanban approach and so what Kanban is, is it gives you the ability to track states of a specific project. So on the top of each one of these cards here is something that’s called in progress so this is a state. Then Need Quizzes, Need Projects, and then each one of them have a state that they are in. And so the way I’ve set this up is this is sequential and if you’re wondering what this is for, this is a process that I use with the curriculum team for Bottega. 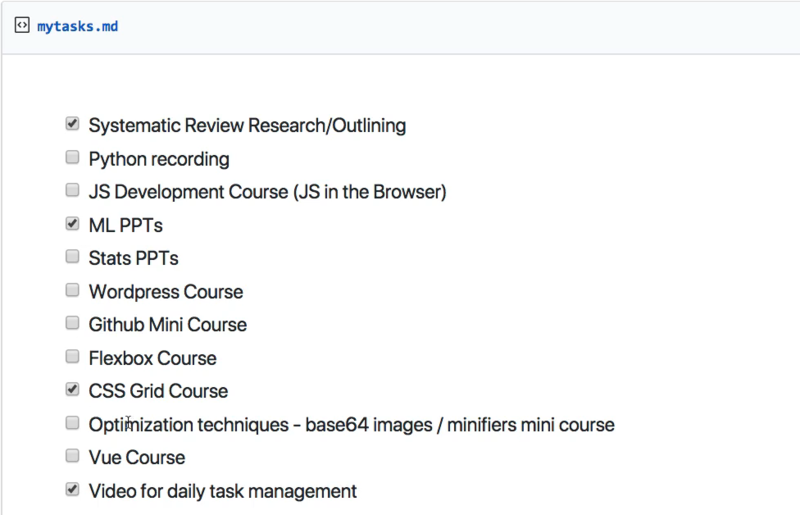 This is how we track to see if a entire course is done and also how we can track and then have reporting on the status of each one of our projects. 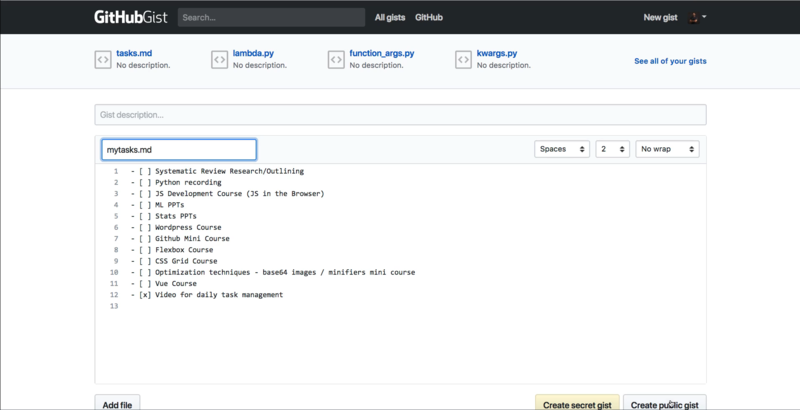 Take for example our introduction to programming with python. Right here we can see that it needs quizzes and so that can tell someone on the curriculum team who’s been tasked with writing the quizzes that if they’re looking for something to do then right here they can come to the course and then start and add that. After they’ve added all the quizzes they can click on this and then drag this task over to the next card. So in this case every one of our courses has projects and so with that in mind we know that when the quizzes have been added it’s on to our task where we need to start adding projects. Obviously, this is very specific to my and my team’s use case. But if you imagine any kind of project that you are working on it probably has various states of being in progress too. All the way down to having a quality assurance team looking at it and you’ll have a custom set of states and processes and you can simply take each one of these tasks on a journey. 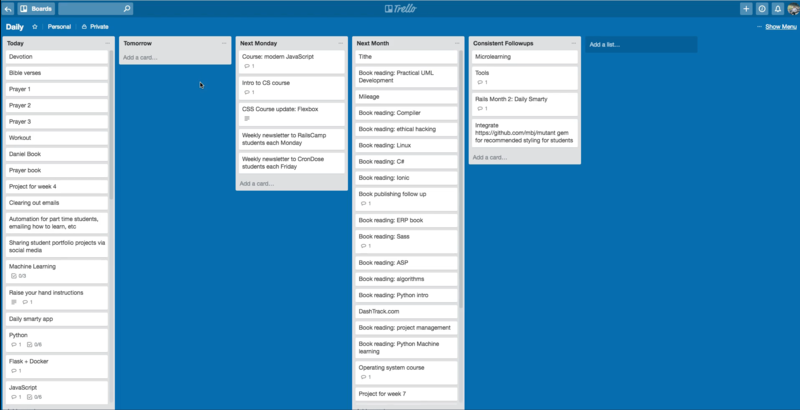 Now, this is a full project management solution. So this goes even beyond a daily task management. 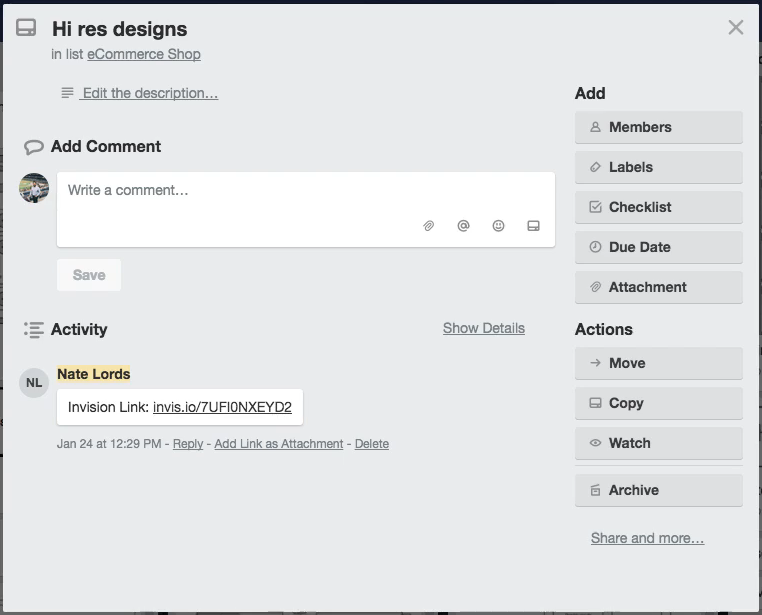 This is going into a tool that you could use if you’re working with a large team of people where everyone can get reporting they can track the status of each item and then they can collaborate and be able to assign tasks to other people. Now I’m going to go to a another board that functions very differently. So this is a specific course board and it has a number of different collaborators. I have worked on each one of these cards. And then we also have designers and engineers that have also contributed in one spot or another. So we are not treating this like a traditional Kanban board. we set up essentially we sent a journey. So we set up each one of these cards to be a state. And then you would take a task and then drag it to the very next state. what I’ve done is I’ve treated each card as its own project and so the goal of this is not to take one of the tasks and then move it over to another board because this is a one project and this is a completely different project. And so here I’m treating it very different than the first example. But what I wanted to show you here was the ability to add quite a bit of metadata. So this is incredibly helpful for having a dashboard where you can look at a project and get all of the information you need all in one spot. So this is fantastic for collaboration and also tracking the progress of each one of these projects. 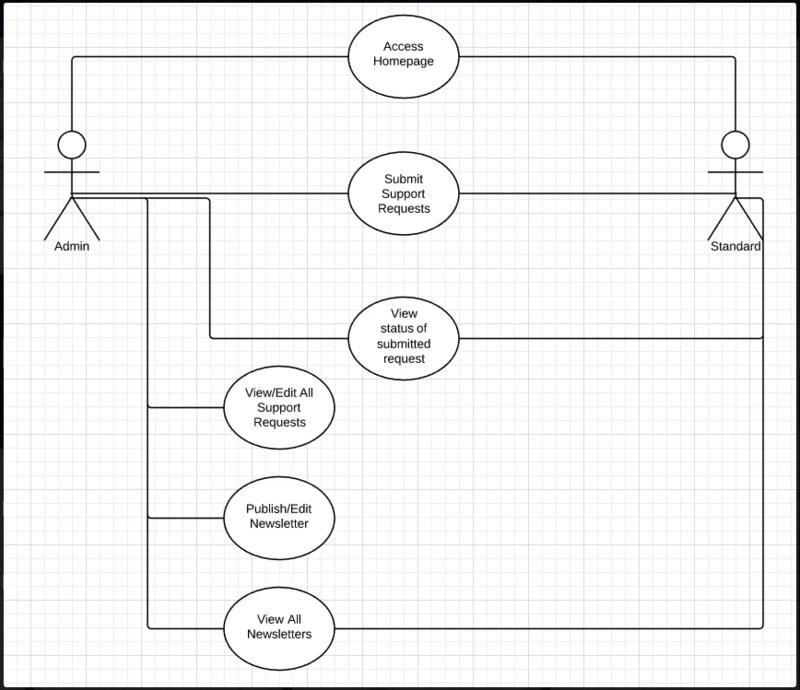 So for example I have to add to this property management application a uml diagram. And so before there was no little diagram here but if you click on this it will actually pop up the diagram that I added. So in the beginning this was completely blank it didn’t have the image. 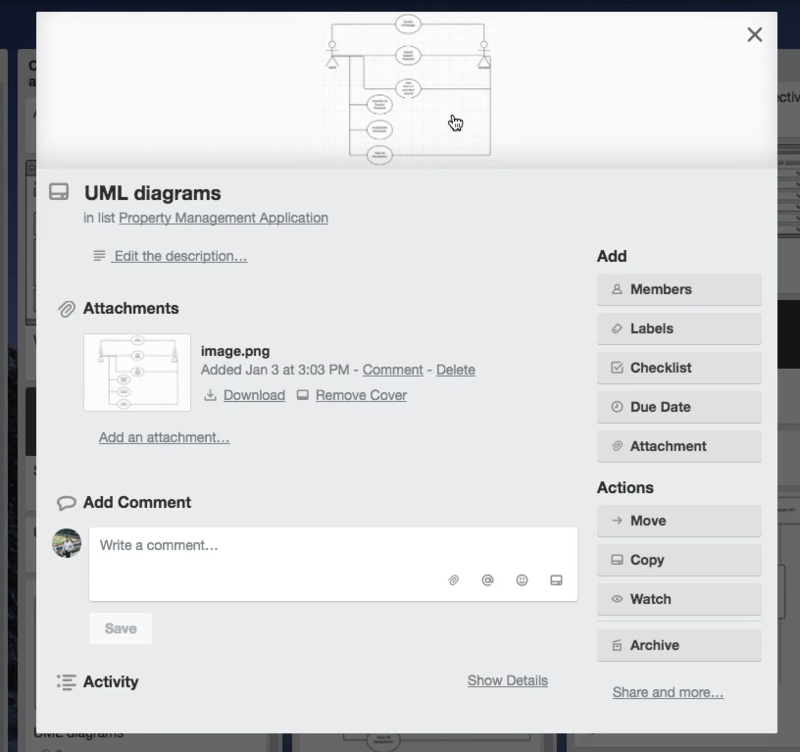 But now after I finish that uml diagram I was able to upload it and now everyone on the entire team can come to this dashboard and they can all see what the diagram looks like and then they can work on it from there. I worked on this with a number of designers and engineers where it started with listing out the goal for the system, which is just a short sentence right here. and as I was doing this the other members of the team were able to see this and we didn’t even have to talk on the phone or have meetings they simply were able to see everything that I added. And then they were able to go and perform their own tasks. So for example the designer was able to go and create a full design for the entire system. And all he had to do was track each one of the items that I was adding and then that gave him an idea on exactly how he needed to structure his own tasks. And then when he was done as you can see right here this was done by our designer Nate Lords. And he simply pasted in the link so that I and the development team were able to come to it and see the completed design. And so we did that for each one of these projects and it proved to be incredibly efficient for us. 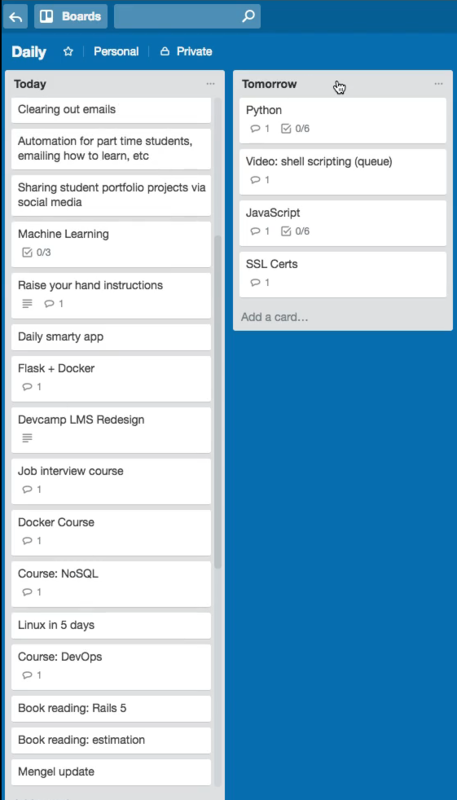 The last Trello example I’m going to show you is my daily Trello. So right here I’ve set up a Kanban board and this is just for myself to work on as you can see you can also have them where they’re private versus having team collaboration. And here I’ve set up the way that I like to manage my tasks. And so I have everything that I want to get done on a daily basis. Now this is a very long list, some of these are projects where I oversee other people and so the task may simply be to call them or send him an email or simply check on the status of a particular item. which is just a really nice easy way of keeping all of the details for something I need to work on in one location. So this is an effective way of doing it. 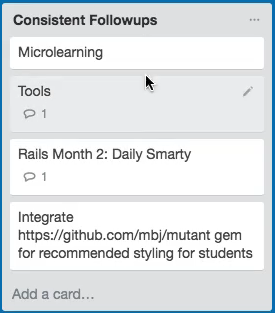 And then what I do is as soon as I’m done with one of these tasks those am done writing the python curriculum and everything I wanted to do on this task for the day I simply come to this tomorrow task and I simply drag it over to this card. And by the end of the day I should have each one of these cards moved over and this entire channel of Today here should be empty. And then what my process is is I simply change the name. So this would be today and then I change this channel to be tomorrow and then the next day I simply repeat it and I dragged each one of these cards over to the other channel. I also as you can see have other ones set up because there are tasks that I perform on a daily basis. But then there are also tasks that I perform on a weekly basis. So I had this channel set up for these all all the items that I want to do starting the following week and then I also have tasks that should only be performed monthly and so they are right here. And then I also have a final item which is this set of items that I just have here for consistent follow ups. It’s just here essentially so that I will not forget about them and so I’ll continually look over here to make sure that I am performing each one of these tasks. So we’re almost done we have completed two of the three walkthrough’s and so switch back here and now we’re going to look at the third option which is the to do list. Now this one is probably one of the most basic options that are out there but because of that it has the lowest learning curve. So if you think back to the daily tracking journal when you did that you needed to learn a number of options you needed to learn a number of different things you needed to learn the process you needed to build out your own system. And it takes not a lot of time but it does take some time to learn. 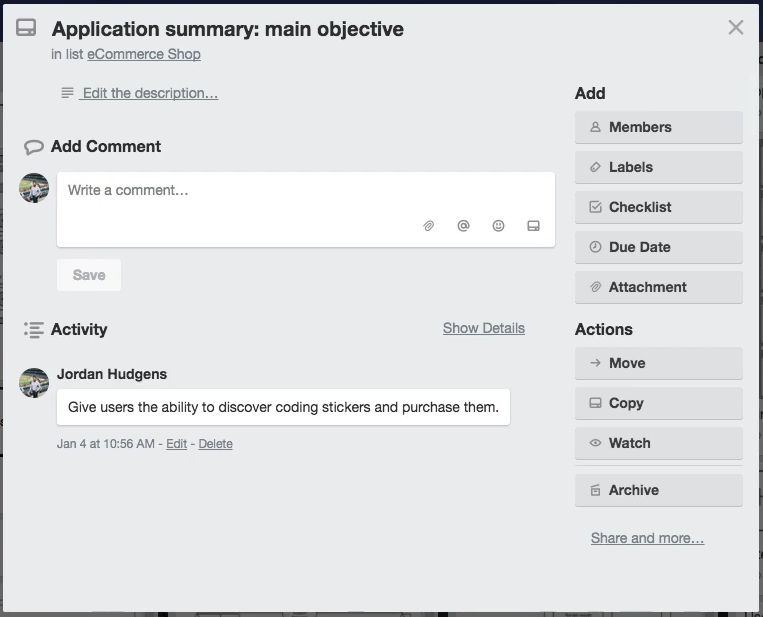 And the next option in working with Kanban boards and working with tools like Trello that takes quite a bit longer especially if you’ve never used a tool like that before. But with this type of system there is pretty much no learning curve is a basic to do list and that may seem like it’s not the most effective approach but as I’m going to show you it actually can be quite helpful when done properly and it is very flexible. and if you’re curious on which of these three systems that we’ve walked through which one I’m personally using I’m actually using all three in some form or another right now because I’ve found that the combination of those three is a way that allows me to be as efficient as possible. I’m continually changing and evolving myself so that is going to adapt. Now if you’re curious if I’m being truthful you can come down even to number 12 here and you can see my task is video for daily task management so I’m actually doing this as we speak. So it’s going to be really nice. At the end of this I’m going to be able to put a little x here and that is going to be crossed off. Now you also can time box these and that’s is something that I do quite often so I might do something like say from 8 a.m. to 10:00 a.m. I’m going to perform this task. because one I already have that my journal and so I’m not a fan of wasting time. So there’s no need for me to put the Times right here. I’m simply keeping this list so that I don’t have to always go back directly to the Journal and I can simply mark items off right here. You notice here this is just what I had in the text editor and if I create public gist what that’s going to do is see how it actually converted this into a To Do List automatically? so I can share this link with anyone else on the team I’m working with and they can see exactly what I am working on and also what the status is so I can come here and say okay this is done for the day and so’s this and so is this item and then they can track that. 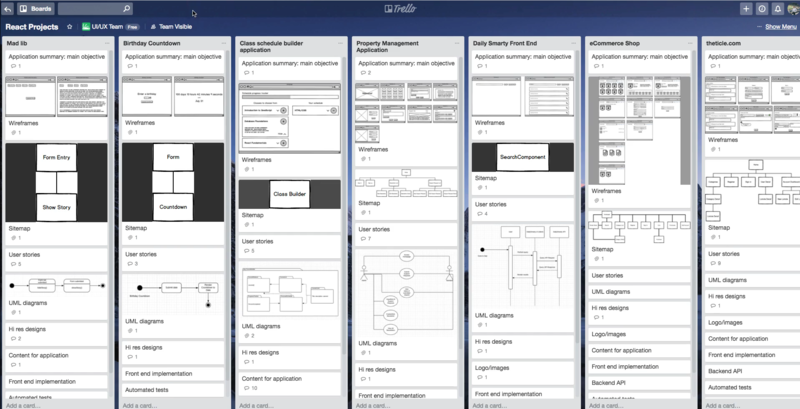 And so if you don’t want to use a tool like Trello you simply want to use something that is dead simple to implement then this is a another option. So in review we’ve walked through three different systems that you can utilize. Daily tasks journalling, we walk through Kanban boards, and just walked through the dead simple to do list kind of system. My recommendation is for you is to try out all of them and see which one allows you to be the most efficient to decrease stress and anxiety and help you organize your goals and achieve them on a daily basis. This is first in the series of Google coding interview questions. In order to pass this exercise, you will need to know how to find all of the potential combinations for an array, along with selecting the values that match a calculated sum. Find all of the potential 3 digit combinations inside of an array that have a sum of 0. Given an array of numbers, return an array of arrays that contain all of the potential 3 digit combinations that have a sum of 0. This is a popular Google interview coding question. It forces you to work with collections of values and perform non-trivial calculations in order to return the correct elements. When it comes to parsing files that contain URLs, a common practice is to have the ability to group URLs by type. In this guide we walk through how to categorize links based on regular expressions. Parse multiple markdown files and group URLs by keywords. In order to successfully complete this exercise, you will need to ignore all of the non rails.devcamp.com URLs, and then group the other two types of URLs into their own nested hashes. Additionally, the markdown files have headings for each day. Utilize the humanize gem so that each day is its own key. There will be 4 full weeks with this type of formatting. In real world development scenarios, a common task that you will be asked to complete is to build scripts to automate behavior. This specific exercise was a task I was handed a few days ago by the Devcamp development staff. 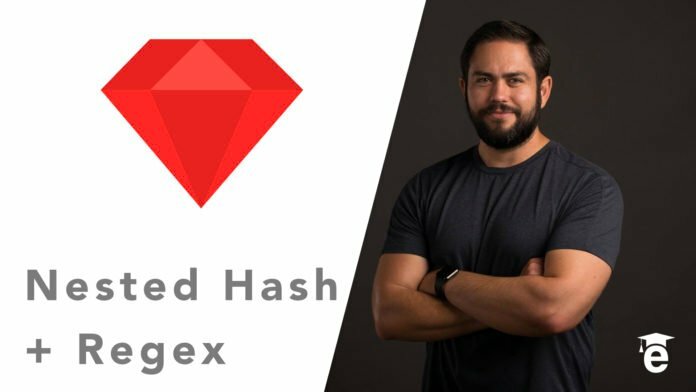 In this guide you will need to work with: regular expressions, nested hashes, and functional programming. Ruby has a helpful method for removing duplicates from an array, the uniq method. However, there are times when you simply want to know which elements in an array are duplicates. 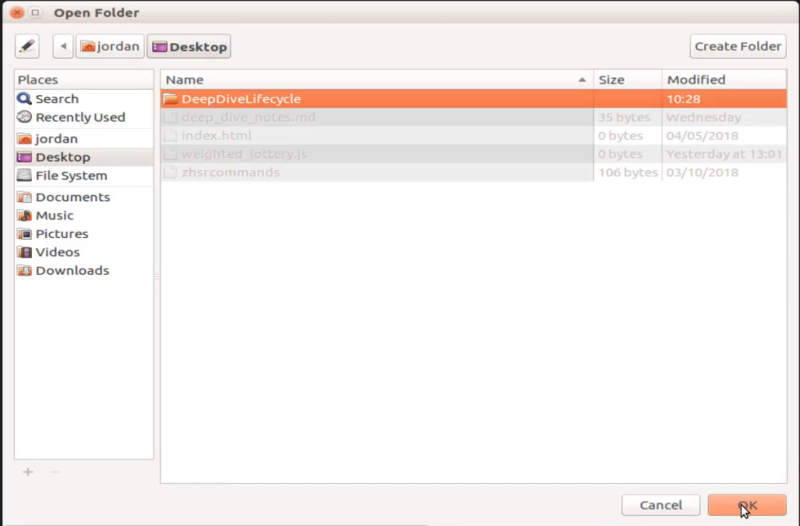 In this guide we’ll add a method to the Array class that returns all duplicates. 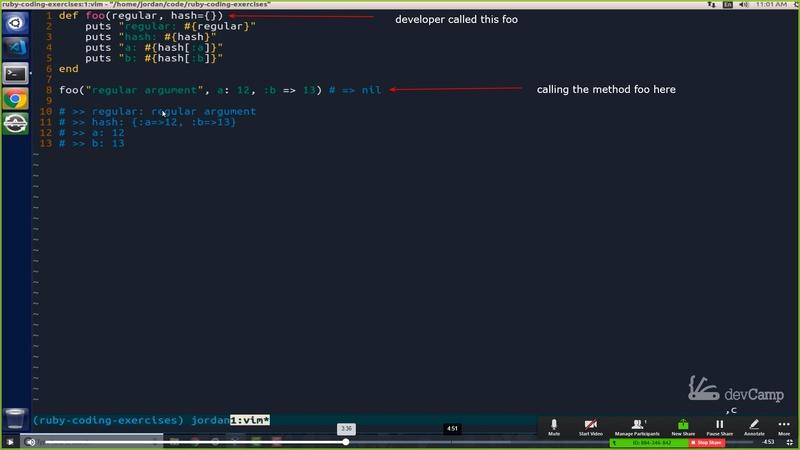 Build a method that returns all of the duplicates from an array in Ruby. Add a new method to Ruby’s Array class that returns all duplicate values. I got the idea for this exercise when I accidentally submitted a duplicate expense into Freshbooks and the system did a great job in letting me know that I may have a potential duplicate expense. Additionally, Ruby has a very helpful Array class method, uniq, that removes all duplicates from an array. However, Ruby doesn’t have a simple way to find all duplicates in a collection, so this will help you examine how to parse through arrays efficiently to return all of the duplicate values. 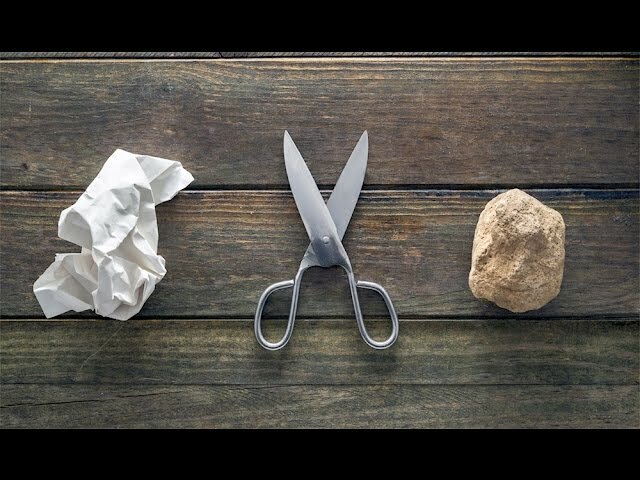 Rock, paper, scissors may seem like a simple game to build, however it offers a great base case for how to build a rule’s engine that can be scaled up for more complex systems. In this guide we’ll examine how to build the game so that users can play against the computer. 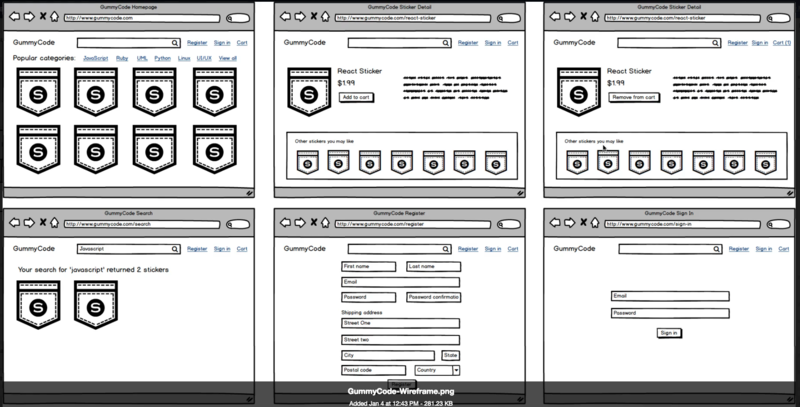 Build a game class that allows users to guess rock, paper, or scissors. Additionally, build a method that generates a random guess from the computer. Finally, pass both guesses through a rule’s engine to return who is the winner of the game is. Focus on building a rule’s engine that could scale to other rules instead of simply creating a large conditional. This is a popular coding interview question, not because it’s overly complex, but because it allows you to demonstrate your problem solving ability, especially as it relates to code flexibility. If you were to build this game and the rule’s engine was comprised of a long set of conditionals, as soon as new rules were added to the game, the program would become convoluted and difficult to alter. However if you properly separate the game concerns it becomes easier to manage.